You know that one moment after you’re done cleaning where your house is perfectly organized. Not one item is out of place. It’s perfect. Unfortunately, it doesn’t last long. This year I am on a quest to have my home organized so that everything has a neat, organized place. 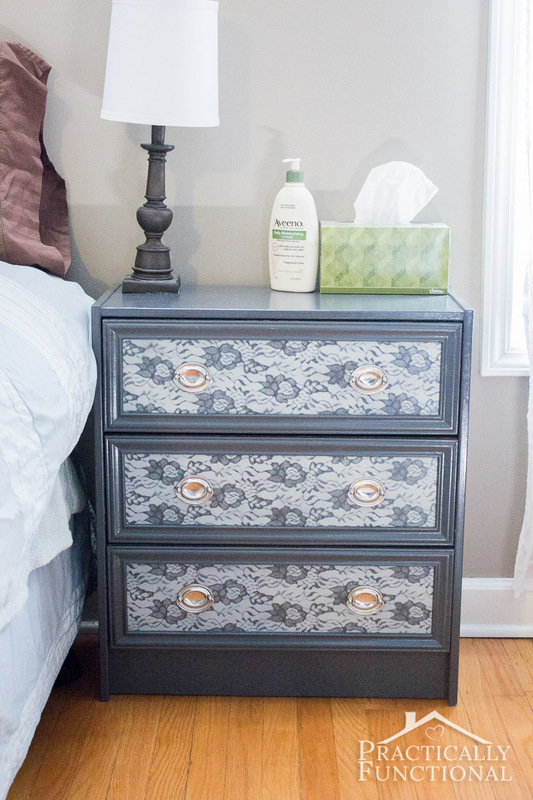 No more messy drawers, packed closets, nor random items that just seem to collect. 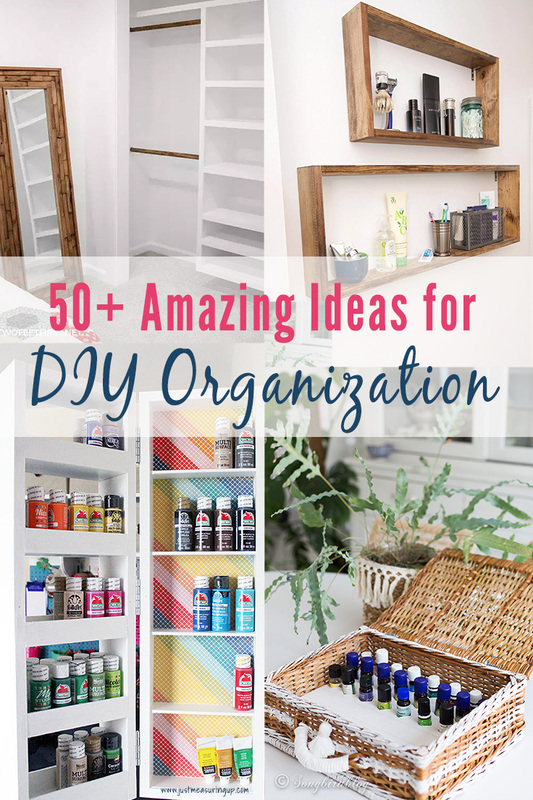 So today, I’ve compiled 50+ DIY organization ideas to help us all in our quests to keep an organized home. 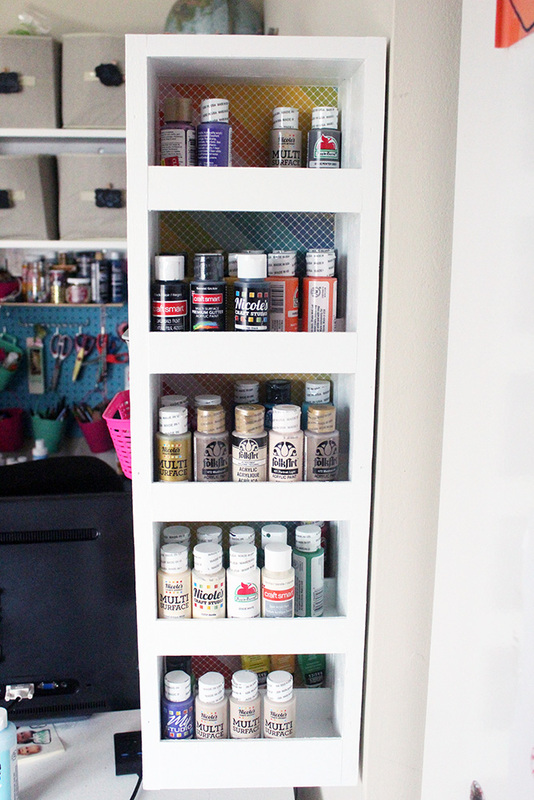 There are some awesome storage and organization DIY projects, so be sure to check them out. 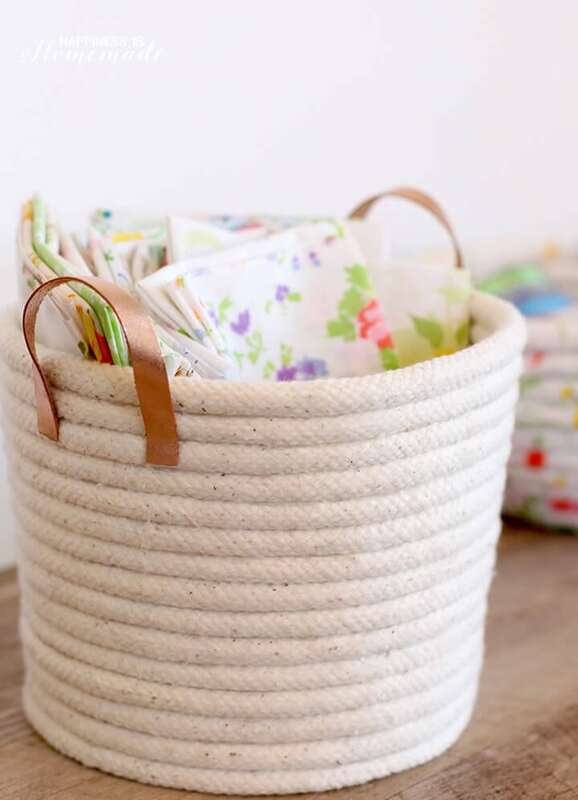 Organized by room, here are dozens of DIY organization ideas for every room in your home. It’s amazing to have an organized area when you are entering and leaving your house. We recently added built-ins to our mudroom, and it’s a wonderful feeling seeing all the shoes, hats, and coats in their designated spots. 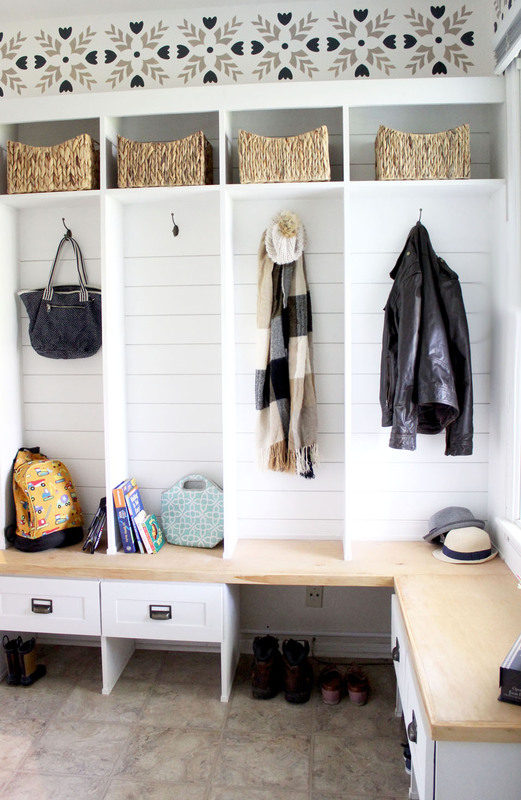 Below are several DIY entryway projects that can help you get your mudroom or entryway organized. 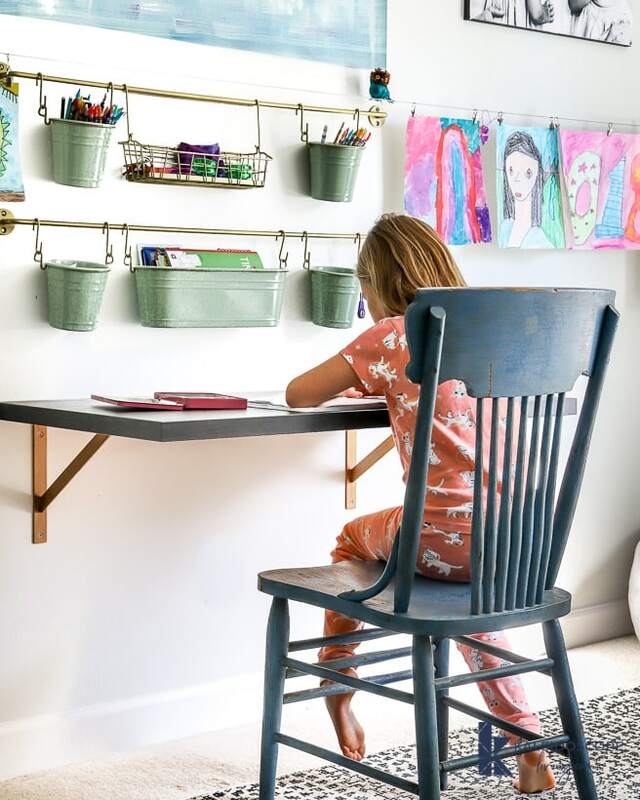 It can be really hard to keep a family room or a living room organized, especially because everyone – especially kids – spend so much time in there. Here are some really great ideas to keep your living room space tidy and functional. 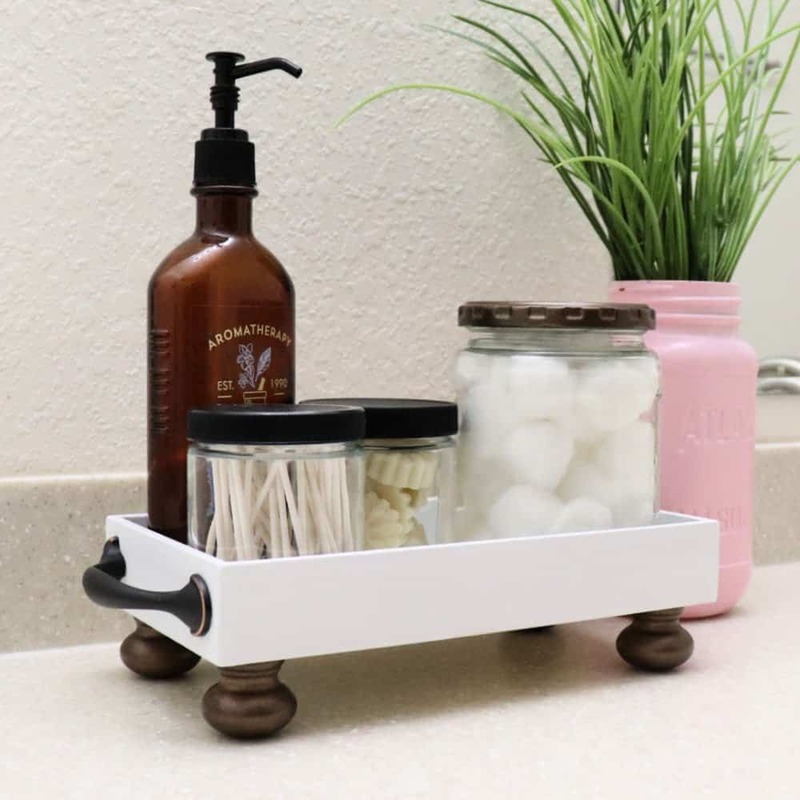 There are so many creative bathroom ideas – from shelving to organization caddies to trash cans. Even if you think your bathroom is pretty organized, I’m sure you’ll find some ideas below that you can’t wait to include in your bathroom. Whether we like it or not, we spend way too much time in the kitchen. 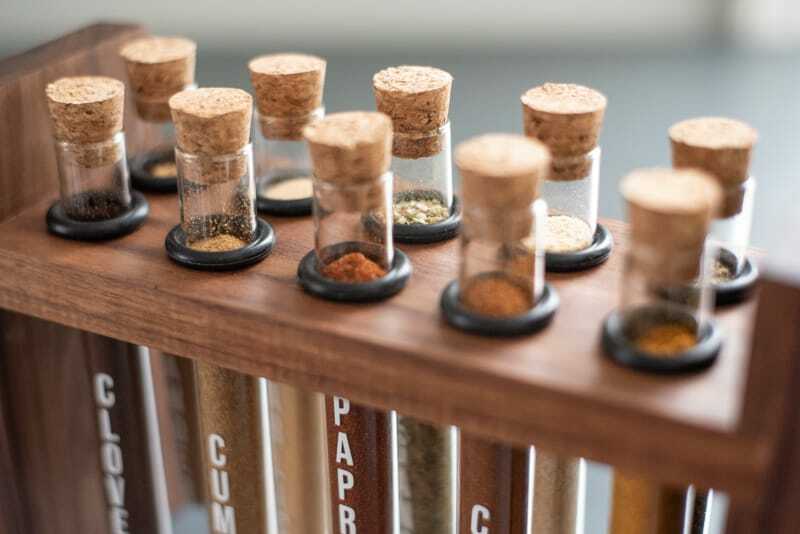 Here are some amazing DIY kitchen organization ideas – including spice organization and pantry organization, which are definitely two hot spots for us. What’s your hot spot in your kitchen? Hopefully the below ideas will inspire you to create a DIY kitchen solution that works for you. 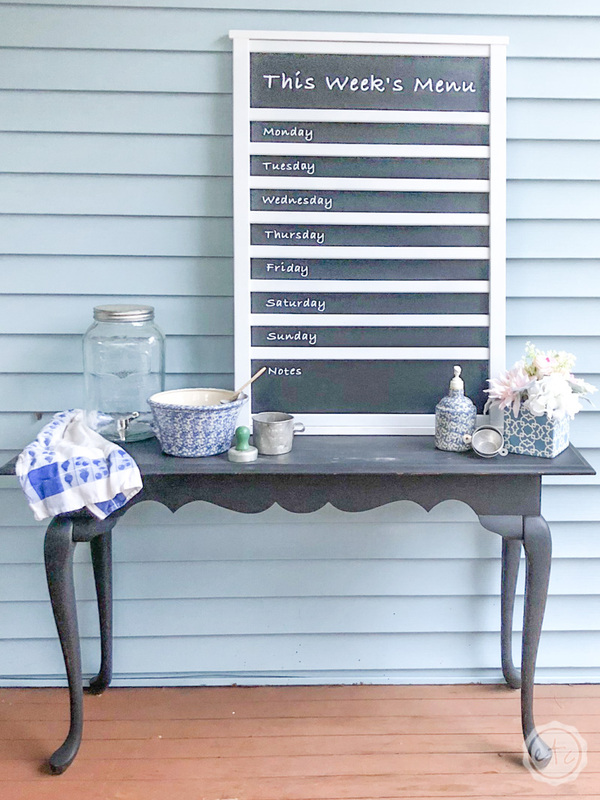 DIY Menu Chalkboard | Happily Ever After, Etc. Ahh the command center. The place that keeps the whole family organized. We are definitely lacking in this department. 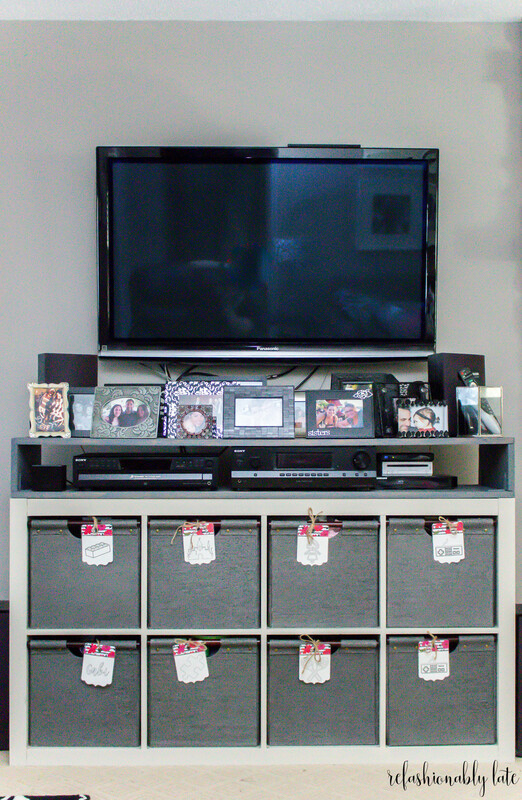 If you’re anything like us, the below ideas for command center organization will help you get up to speed. 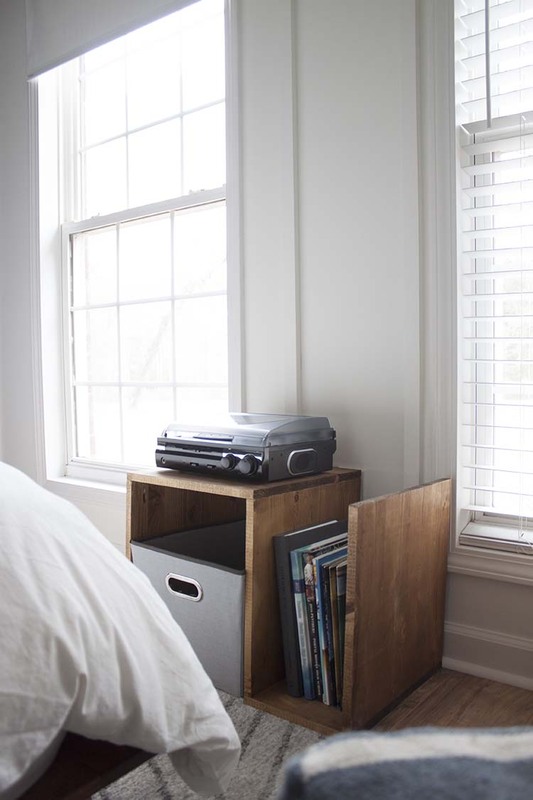 Having an organized bedroom and closet can start your day off on the right foot. So many times there’s a lack of storage in bedrooms – and closets usually come with just one rod and one top shelf. The below bedroom and closet organization ideas will help you to organize your clothes, jewelry, nightstand items, essential oils, and more. 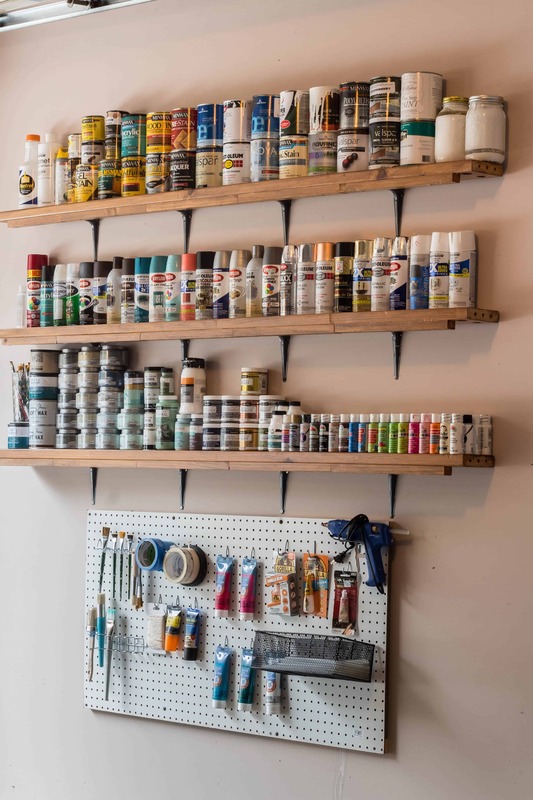 Crafters usually collect so many different types of items – paint, fabric, felt, yarn, thread, card stock. Gosh, you can even have half a dozen pairs of scissors. 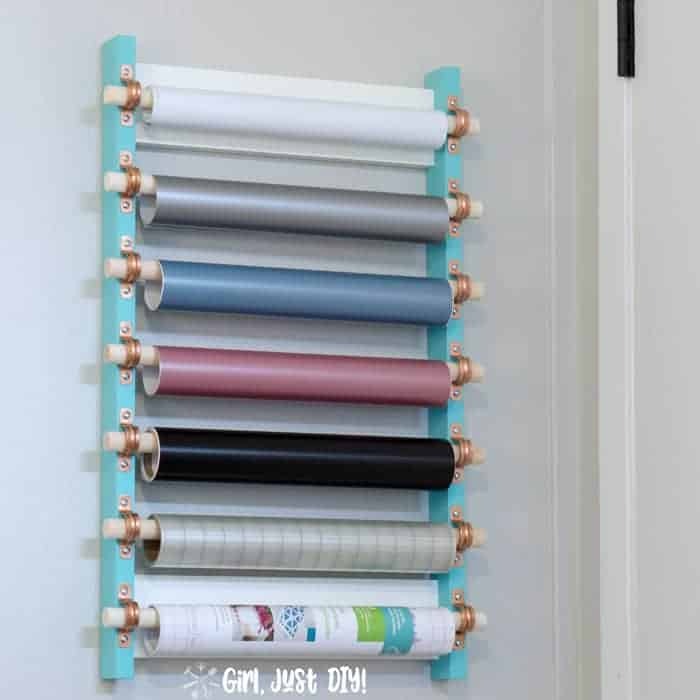 It’s tough to keep everything organized, but these below ideas can definitely help bring some organization to your craft room. 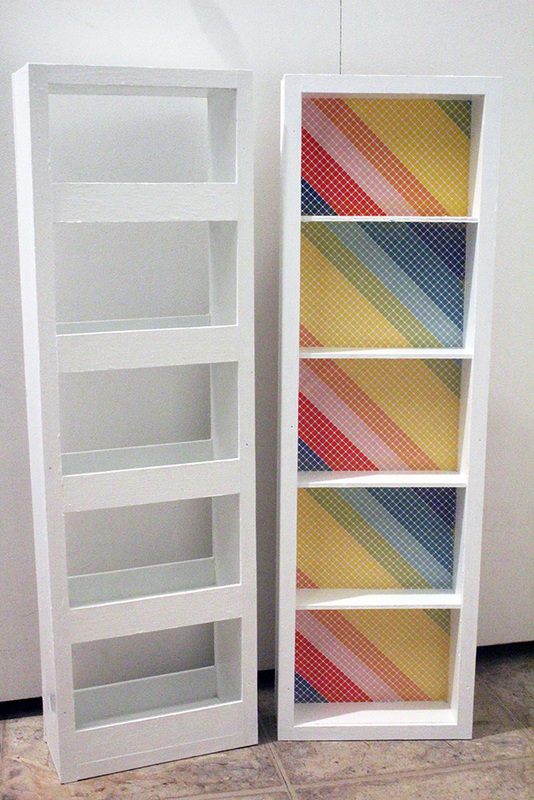 Vinyl Storage Rack for the Craft Room | Girl, Just DIY! Getting your play room organized is such a tough task, especially when the little ones can destroy it in a matter of minutes. Happens all the time over here 🙂 Below are some great DIY ideas to get your playroom looking neater. 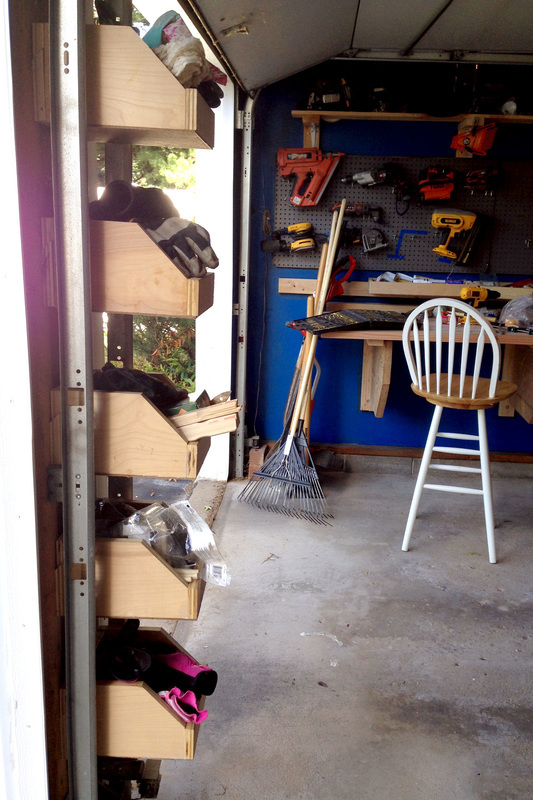 Just as kids playrooms get so disorganized, it’s so easy for our tools and garage to become the ultimate mess too, especially when you have several projects going or are constantly adding more tools and materials. 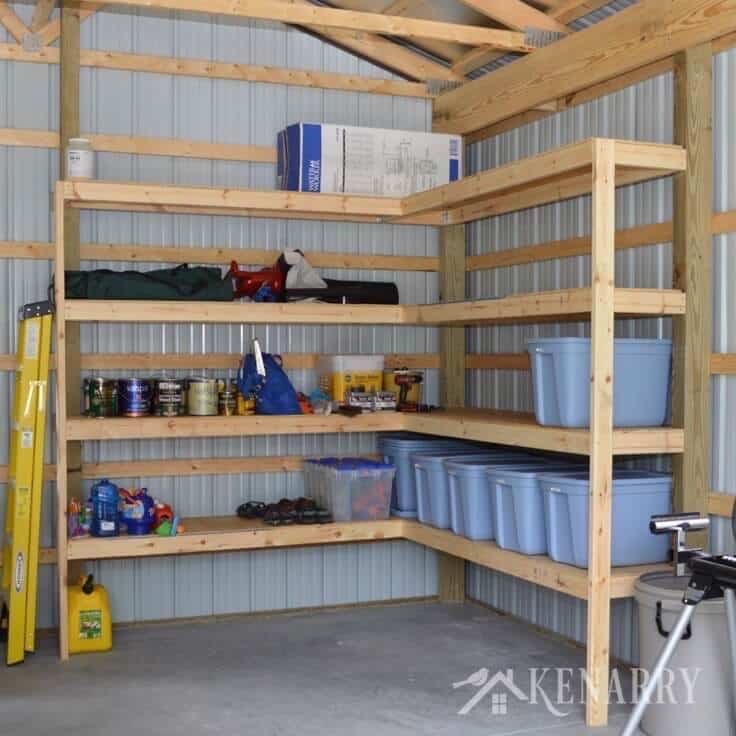 These ideas will help you keep your tools organized, with or without a garage. 50+ organizational ideas for your entryway, living room, bathroom, kitchen, command center, bedroom, craft room, playroom, and garage. 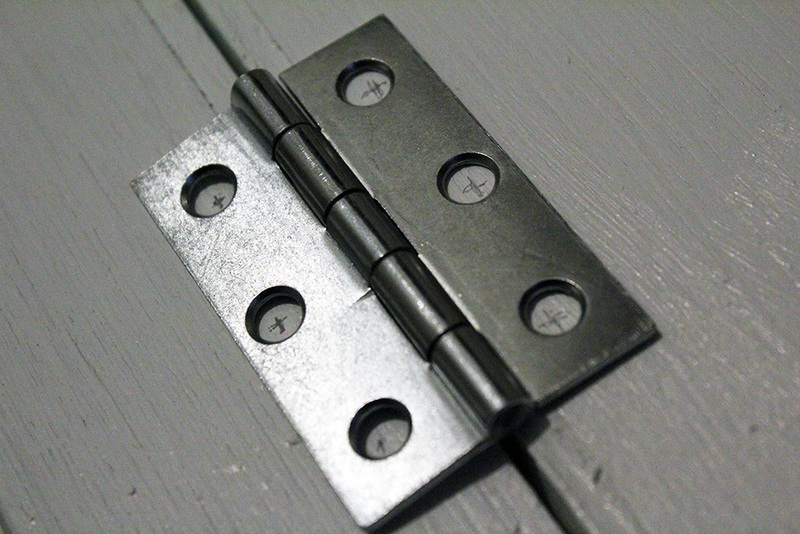 So many amazing DIYs that can help you. I hope these DIYs inspired you to take charge of some of these messy areas of your home. 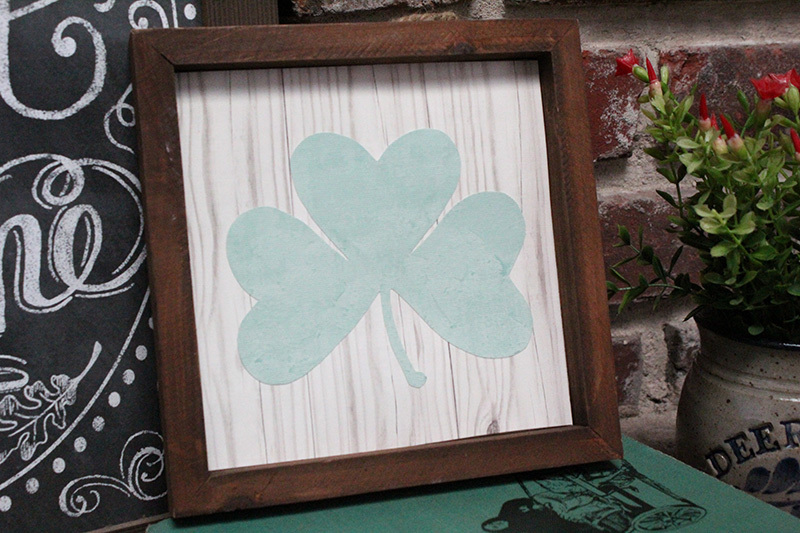 Make this easy St. Patrick’s Day DIY decor craft to decorate your home. 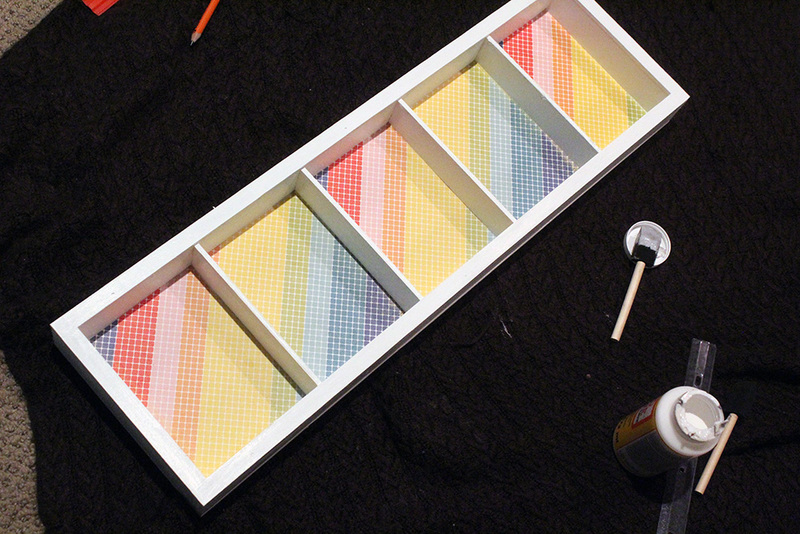 The materials for this craft are simple and you can make it in 10 minutes! I love decorating for St. Patrick’s Day for so many reasons. First, I’m almost 100% Irish. Second, I love decorating with shades of green. And third, I feel like St. Patrick’s Day is the beginning of spring. The greens make everything look so happy and vibrant. The problem is that it’s hard to find St. Patrick’s Day decor that isn’t cheesy looking, so I almost always make my own. 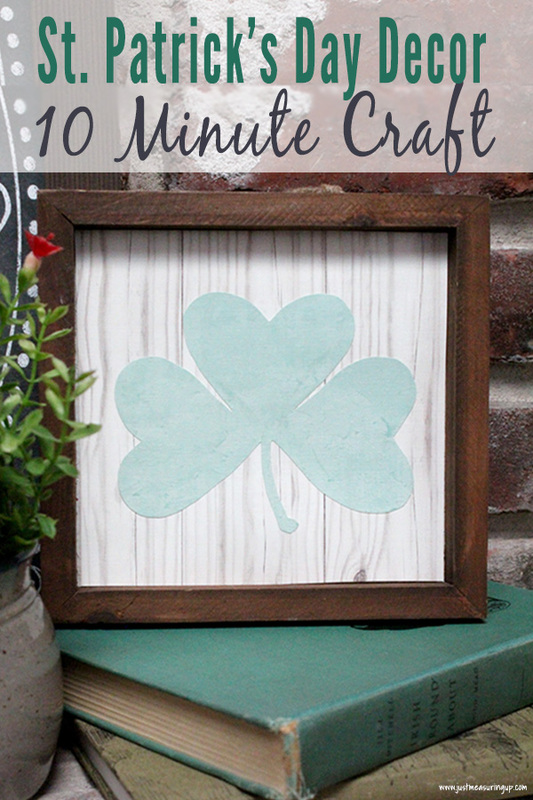 Today, I’m sharing a super easy St. Patrick’s Day DIY project that you can do in just 10 minutes. 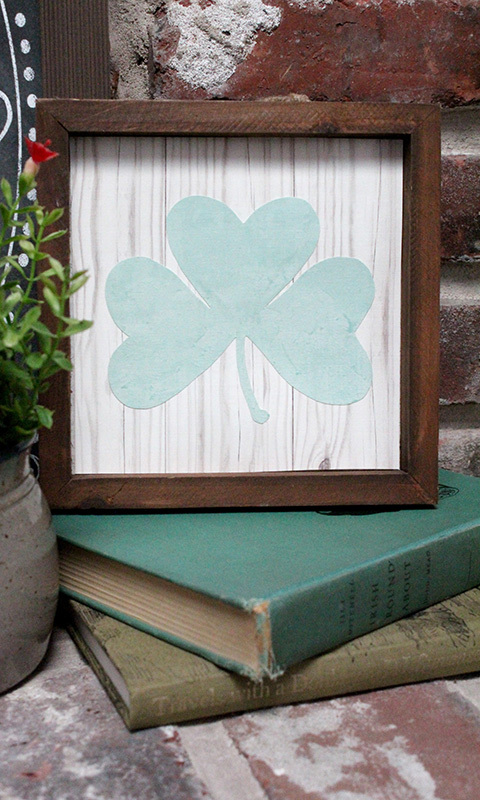 This DIY shamrock picture is very simple to make, and it turns out so pretty! 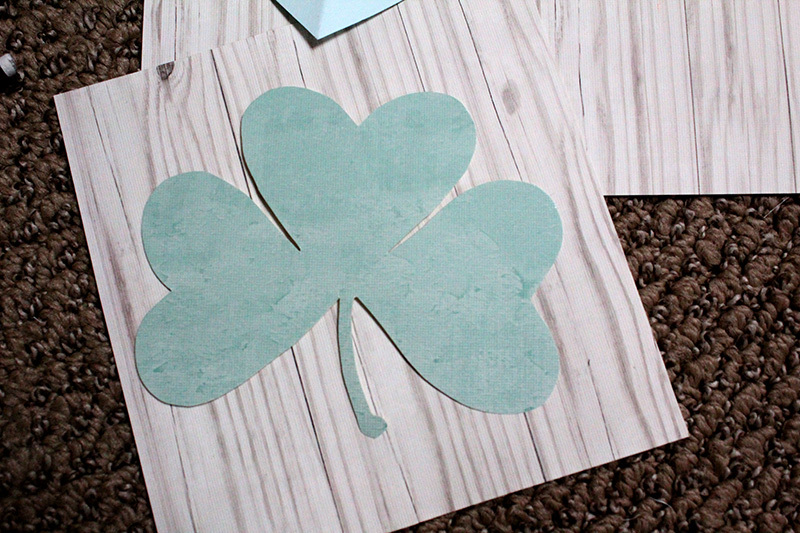 The materials for the St. Patrick’s Day DIY decor craft are listed below – but if you’re a crafter, I’m sure you can find this materials around the house, making this a zero dollar project. 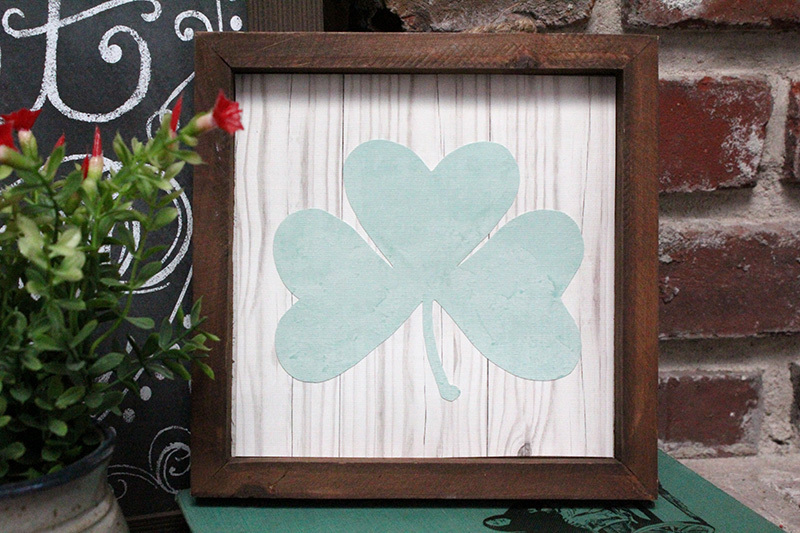 These four simple steps will show you exactly how to make this DIY shamrock picture frame. First, I looked at what materials I could use for the background, and I settled on scrapbook paper. I had a book in my collection from my sister’s bridal shower last year. Many of the patterns weren’t touched – and I loved them even more than when I originally bought them. I chose one scrapbook sheet for my background – it was one that looked like a birch tree, and I chose another one for the shamrock. This one was light green. Both sheets of scrapbook paper looked textured but worked well together. 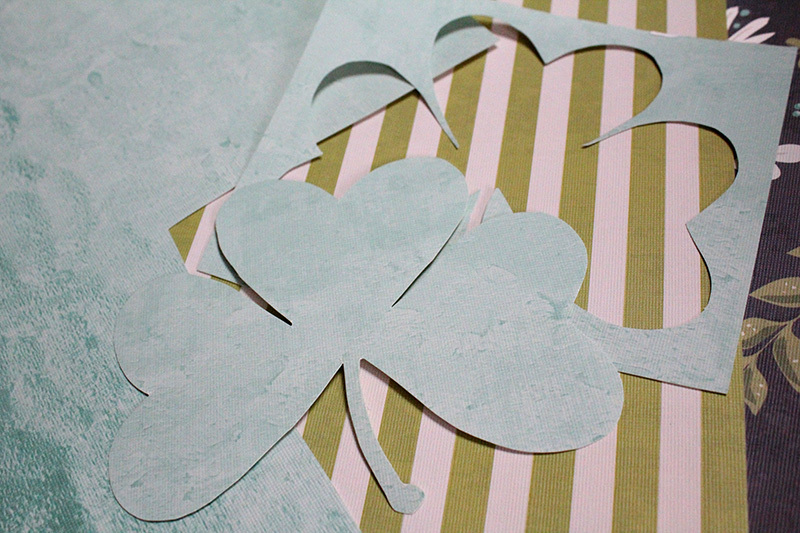 If you choose fabric, then just attach your shamrock with mod podge instead of glue. Next, I looked around the house for a picture frame that would work. I had this simple heart (below) up as decoration for Valentine’s Day, and I loved how the frame was deep and there wasn’t any glass. 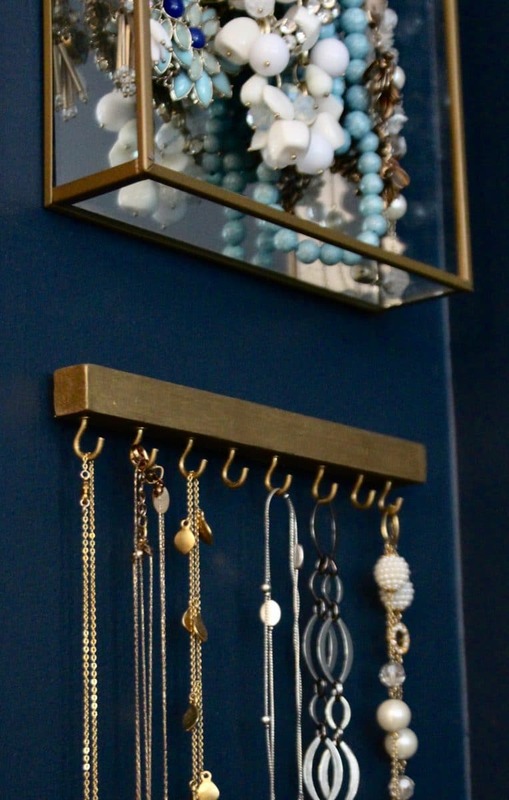 I always take the glass out of frames if my pictures are hanging in a place where they constantly glare, or if I’m hanging them in my kids’ rooms. Also, I thought about making a simple frame. It would be super simple, so I’ll probably do a tutorial on this soon. 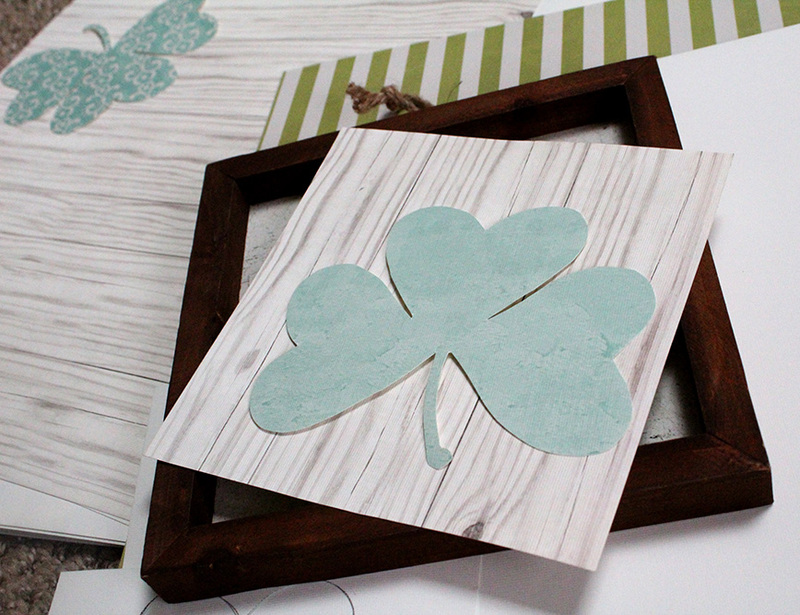 After, I had chosen my picture frame and my scrapbook paper, I got started on my shamrock. How to draw a shamrock? 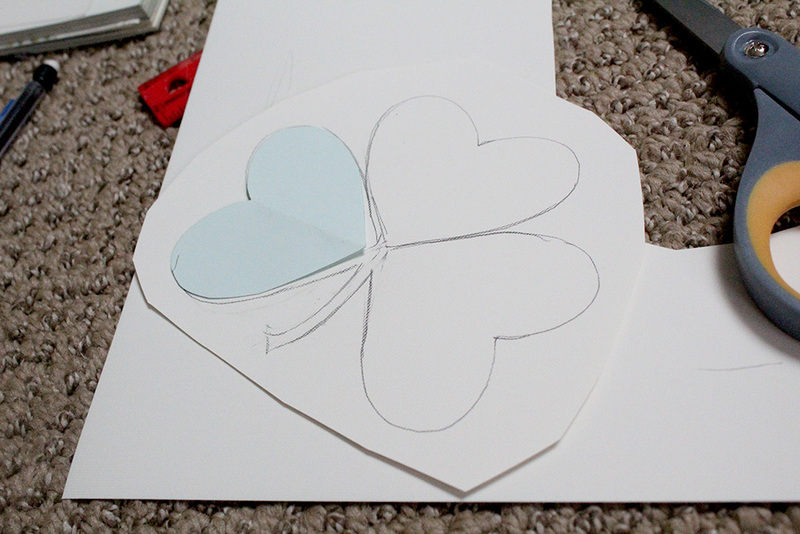 You can draw a shamrock really easily by just drawing one heart. Then cut out the heart and fold it in half vertically. Trim as necessary, making sure the heart is symmetrical. Cut your shamrock out. Use a good pair of scissors – it’s worth having a nice pair of scissors for crafty projects rather than your junk drawer scissors. Next, you’ll trim your background to fit perfectly inside the picture frame. 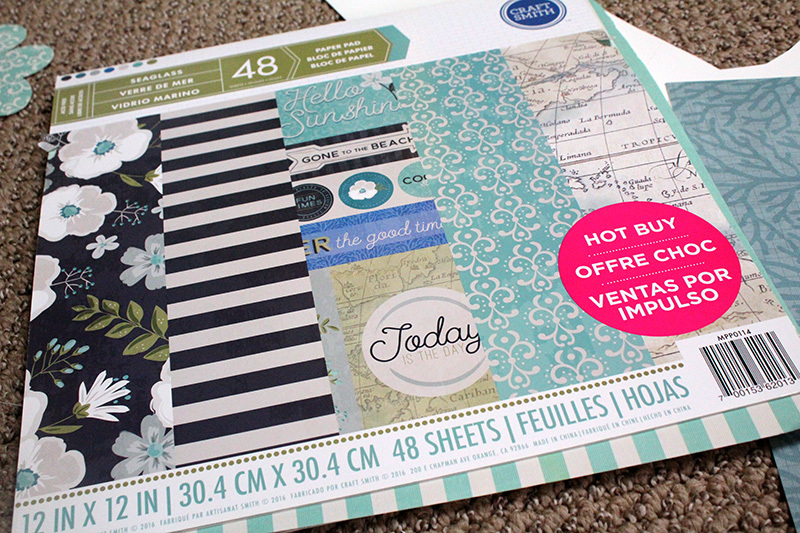 Make sure to measure carefully so you aren’t wasting your scrapbook paper. After that, just glue your shamrock to your scrapbook paper and place in the frame. 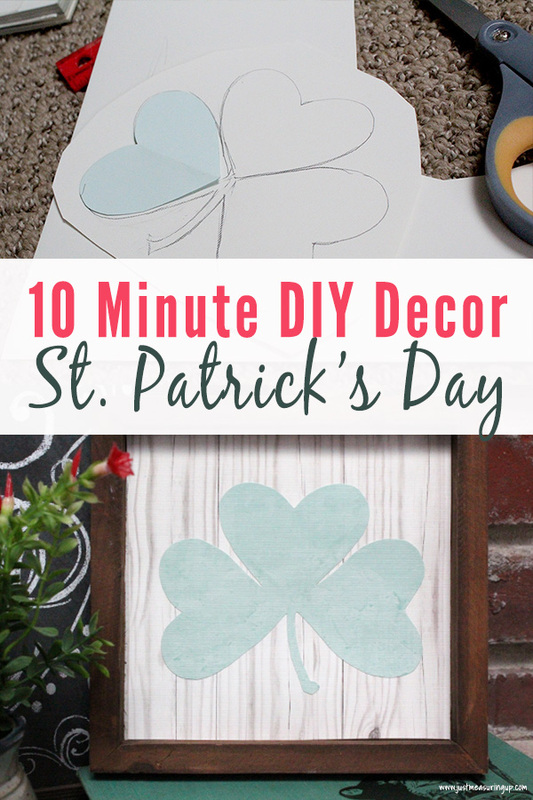 It’s definitely a very simple St. Patrick’s Day DIY decor craft. The cost of the DIY shamrock decoration was zero dollars because I found all of the materials for this decor craft around my house. I love a DIY where you can use things you have. But, the best part is definitely that you can easily remove your shamrock and reuse for the next holiday. A bunny would look perfect, wouldn’t it!? 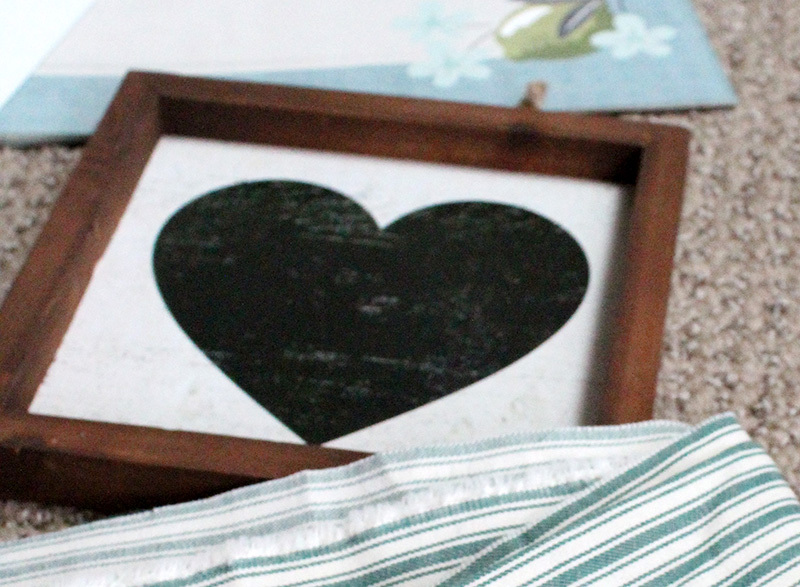 If you’re looking for another DIY St. Patrick’s Day craft, check out this easy burlap banner. 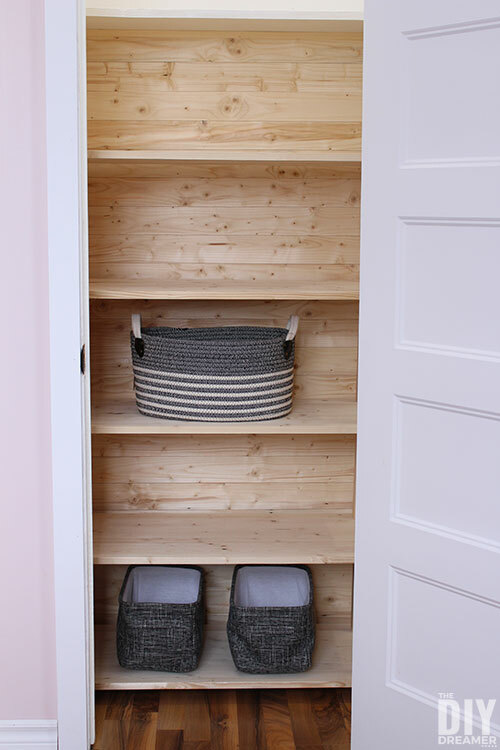 This post will show you how to make these easy wall shelves that swing out, providing ample wood storage for small spaces. 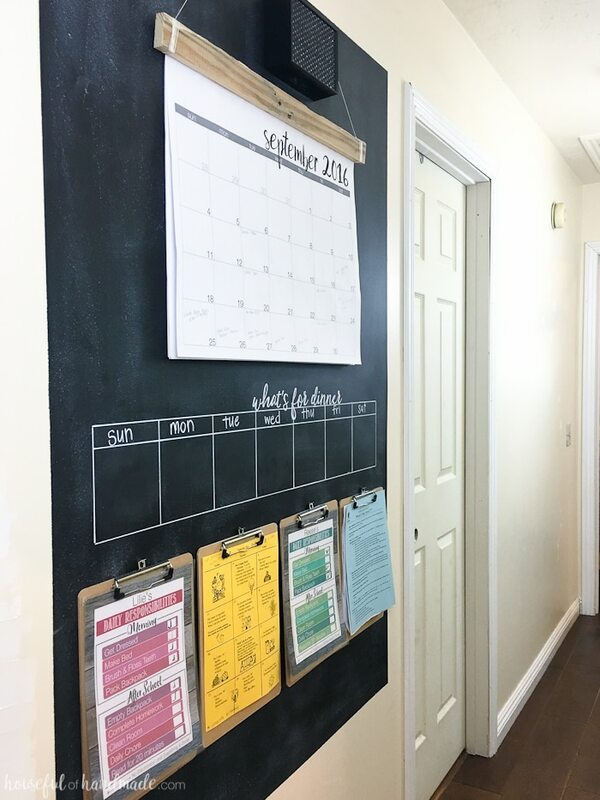 In an effort to share more creative DIY ideas and generate fresh content, my friend Megan from Two Feet First and I have co-organized a group of fun DIY challenges. 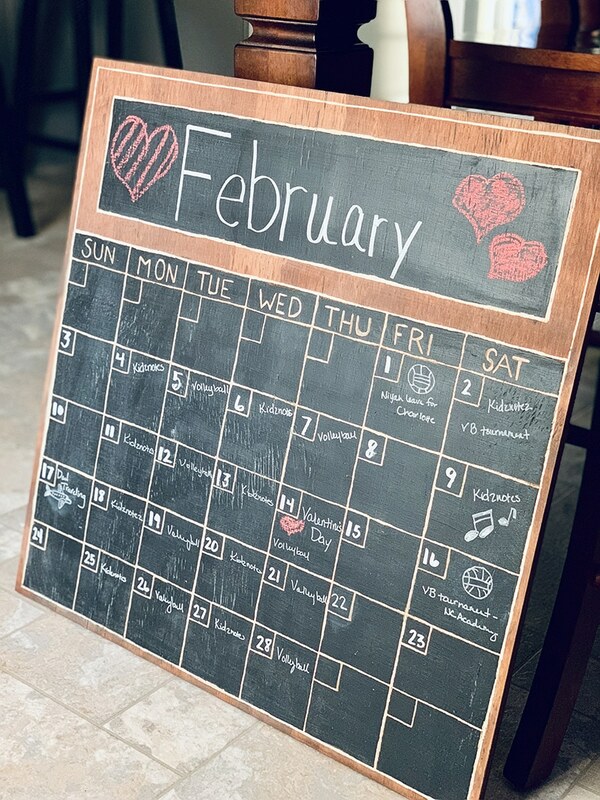 For every month, there is a theme, and almost 40 talented DIY bloggers will be participating and sharing their how to projects focused on that theme. The themes are really fun, such as building a whole project with a 2×4 or building a piece of furniture cheaper than buying it – you can find more here – At Home DIY. 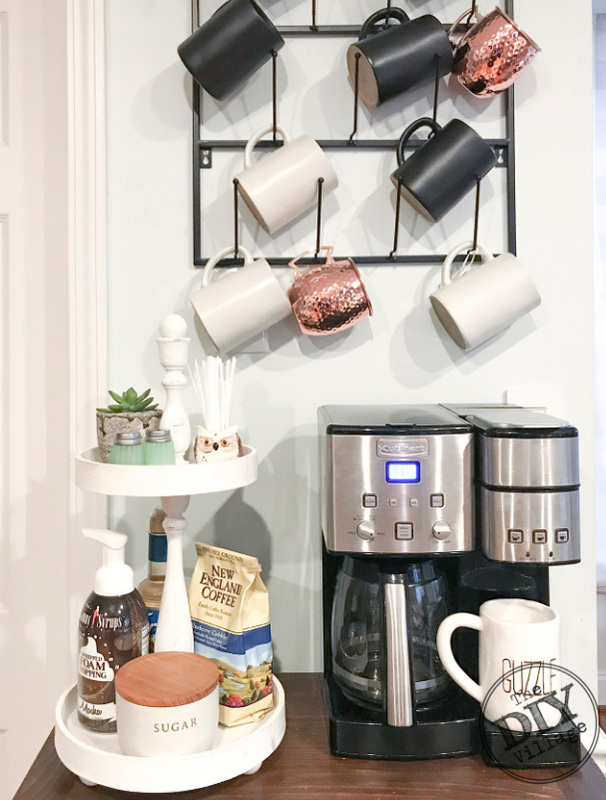 This month’s theme is to Build to Organize, and my hubby put together these DIY swing out wall shelves for my craft room. 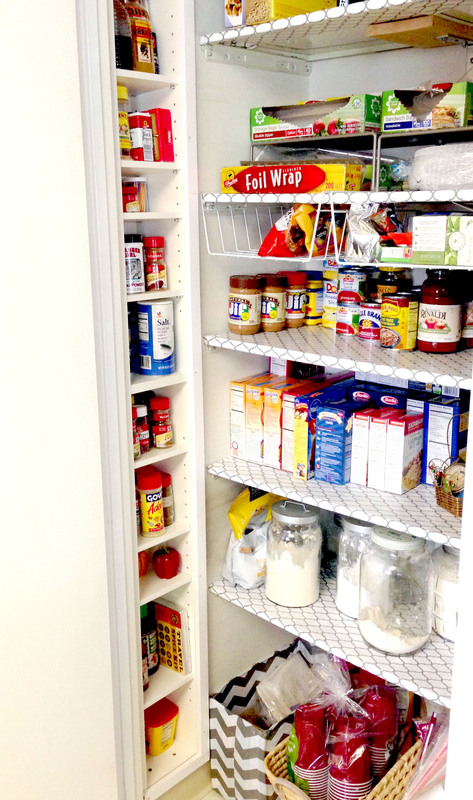 Be sure to scroll to the end of this post to check out everyone’s “Build to Organize” projects. 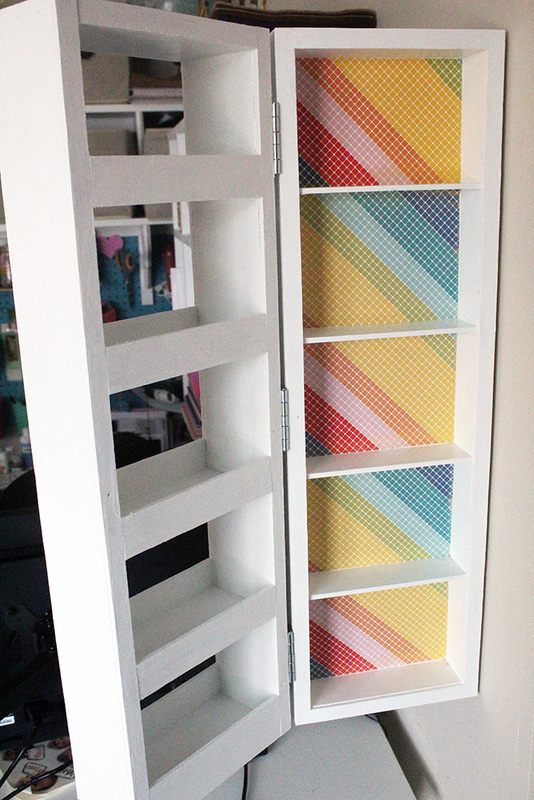 There are some awesome organization DIYs! I love a good storage solution – a creative way to store something, a hidden pull-out cabinet, furniture that folds out from the wall. In fact, the tiny house shows are my favorite. I am always oogling at all the ideas to create more storage. I have a little craft corner in sitting room off our bedroom, where I thought I had completely maximized my wall storage space. 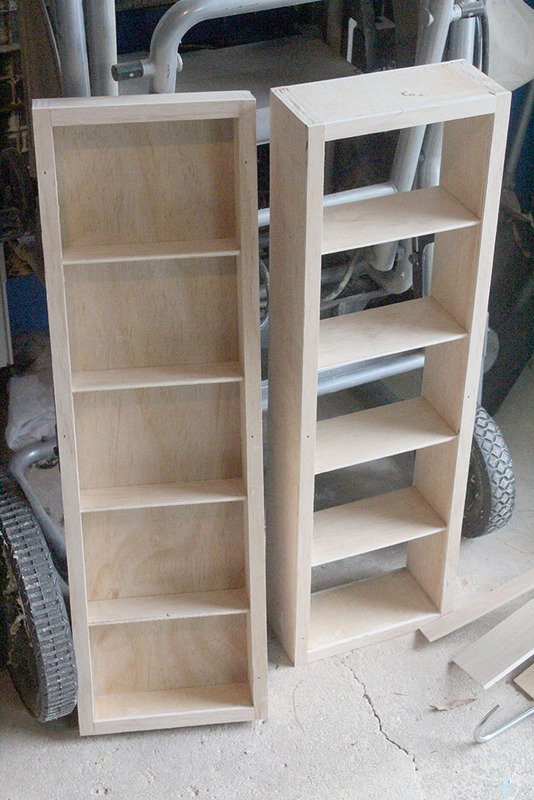 However, I found a seven-inch area on the end of a cubby shelf we built, where I could add more storage. 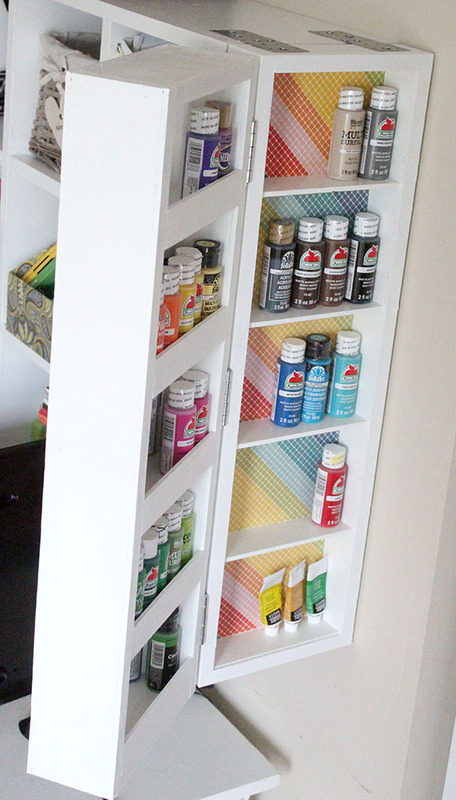 When thinking about organizational ideas, I was thinking of making just a simple shelf to hold some of my acrylic paints, and then my hubs comes along and turned my design into a swing-out shelf, that would hold three times the paint bottles. After all that, it looked just a little too plain, so I added the colorful background. 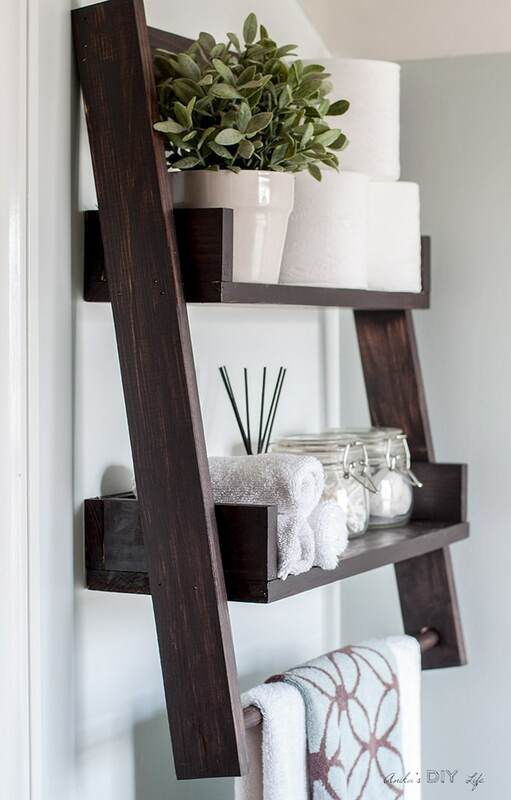 The best part of this design is that you can build just the simple shelf, or you can build both pieces, making this easy DIY swing out wall shelf. 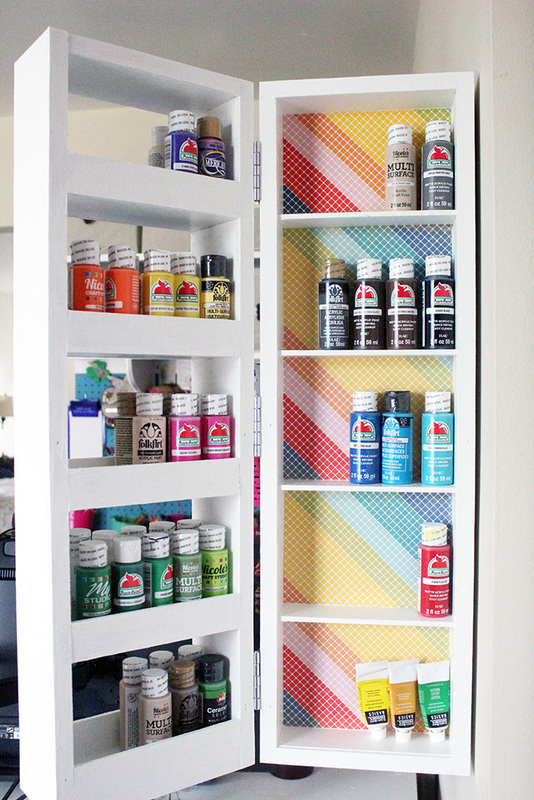 The simple shelf holds one row of paints, and the second piece holds two rows of paints. If you build the whole thing, like we did, you’ll have three rows of shelving. 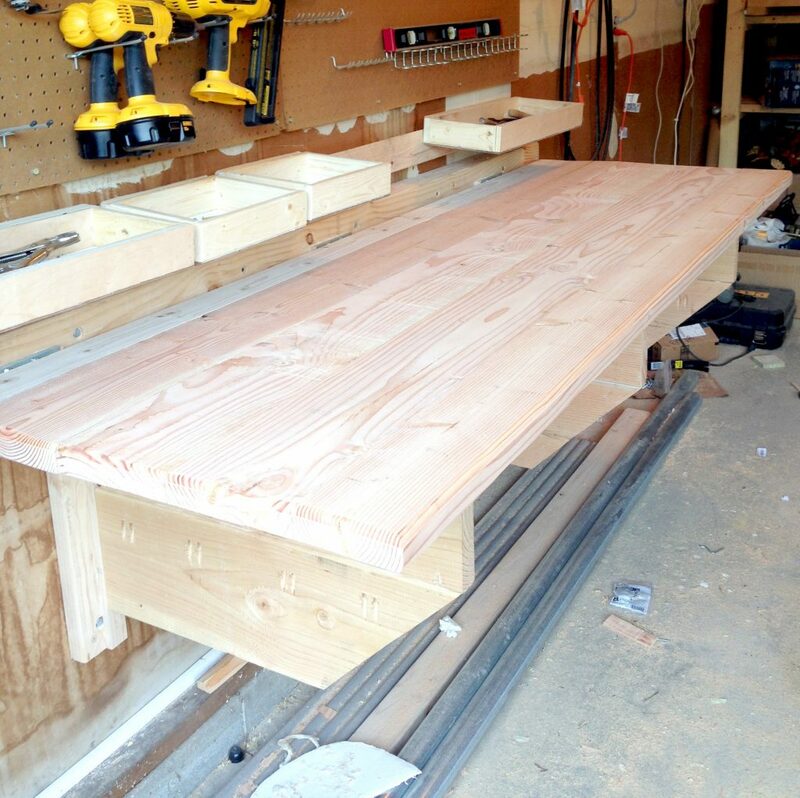 Here our my hubby’s instructions on how he built these swing out shelf cabinet. The swing out shelf was going to attach to the end of a cubby shelf I had built. We love to maximize all the space everywhere. The project consisted of two vertical boxes of shelves. Either one could work as a stand alone shelf, but we like to kick things up a notch. So I planned on hinging the shelves together for maximum storage efficiency. The left box would swing freely, and the right box would be affixed to the wall. For the freely swinging box, I had to put small ledges to prevent items from sliding off the shelves while opening or closing the unit. I also had plans for a small magnetic catch to keep the shelves closed when not in use. 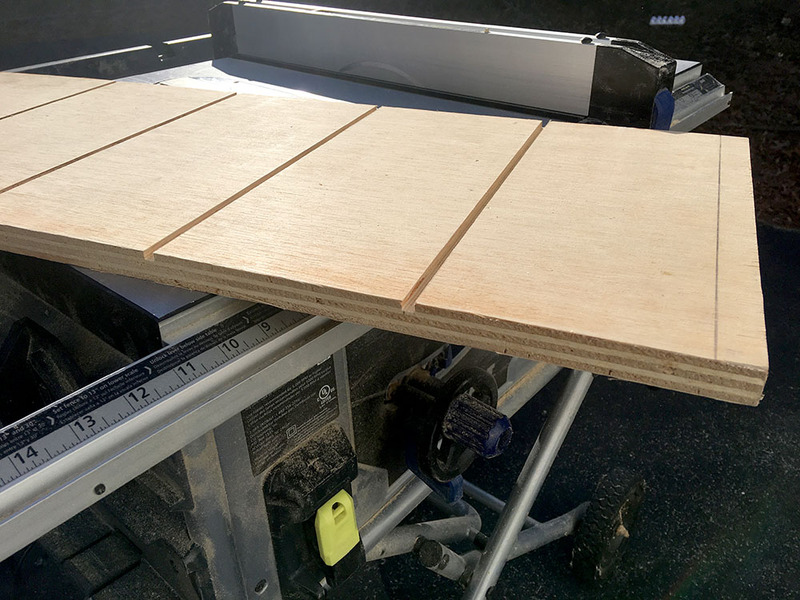 To start this project, I used my table saw and cut out a piece of 3/4″ thick plywood, about 30″ x 12″. 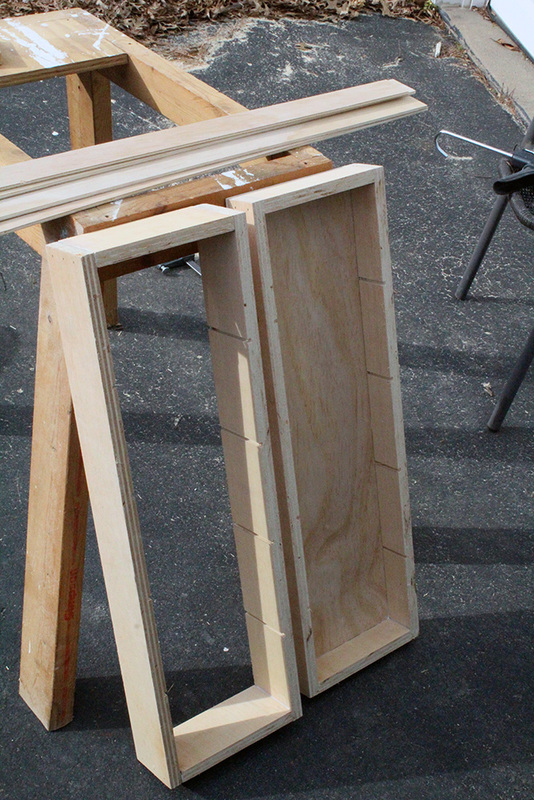 This piece would be used to construct the frames for the two shelving units. I actually wanted to use boards for these shelves, but I didn’t have any lying around the garage. So plywood would have to do. 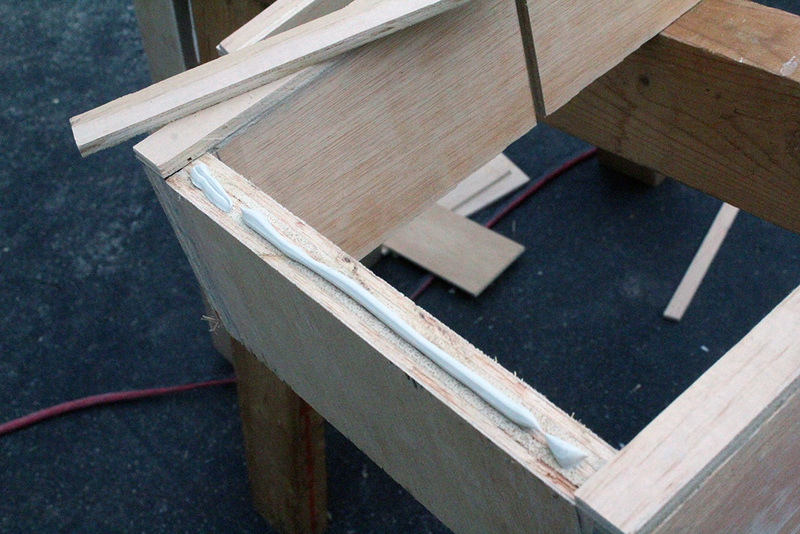 The disadvantage of the plywood was that I would have to glue on some trim to hide the exposed plywood edges. Also, plywood doesn’t have as smooth a surface as boards. However, I love a good scrap wood project, and this route worked well. 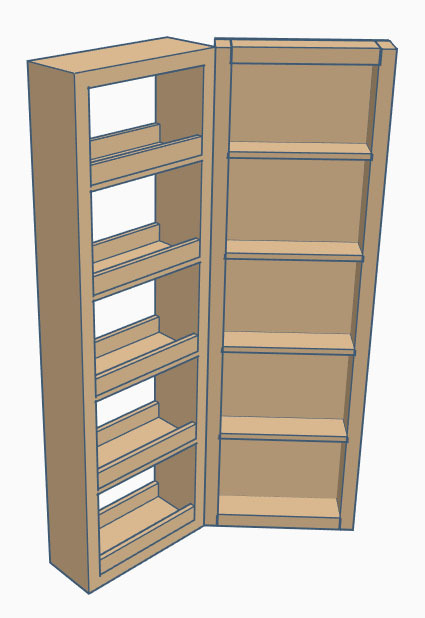 With my plywood cut, I used a pencil and ruler to mark the positions of slots where the individual shelves would go. 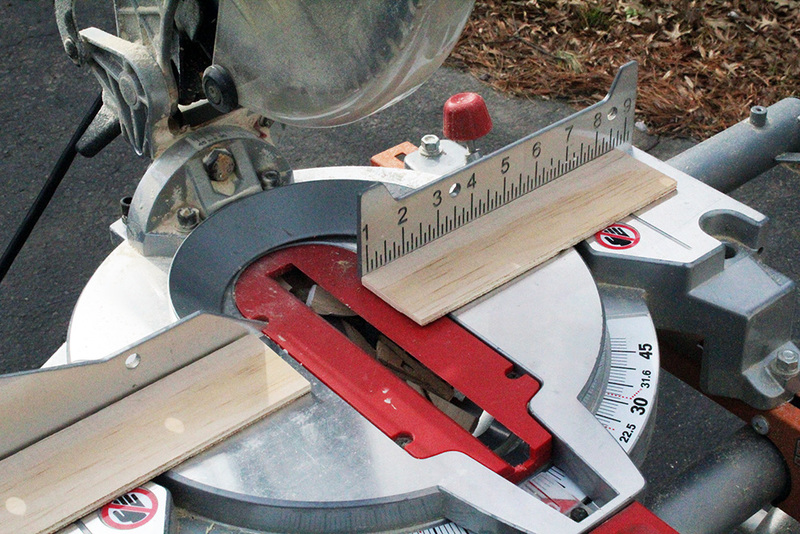 I planned on cutting grooves to insert 3/8″ thick plywood sheets for the shelves. I used my table saw to cut out the shelving grooves. 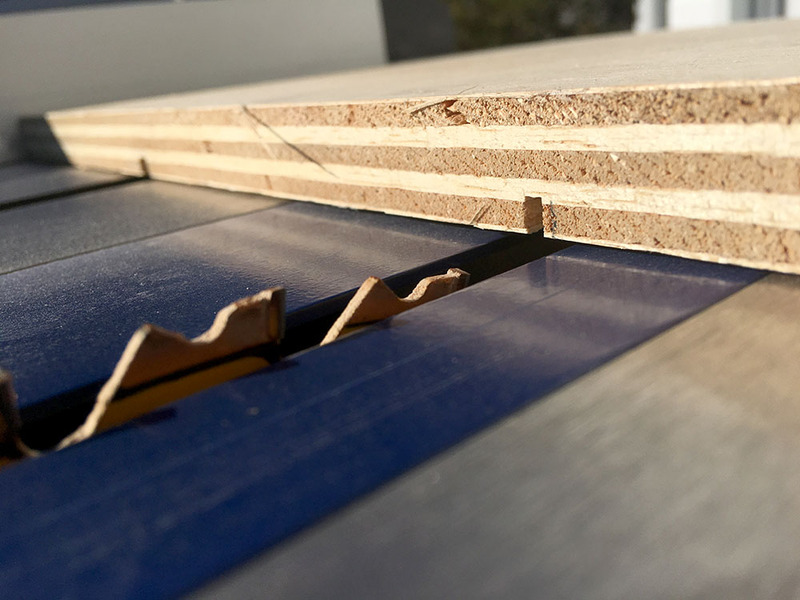 Since the table saw blade was only 1/8″ wide, I had to make 3 separate cuts to get each 3/8″ wide groove required for the shelves. 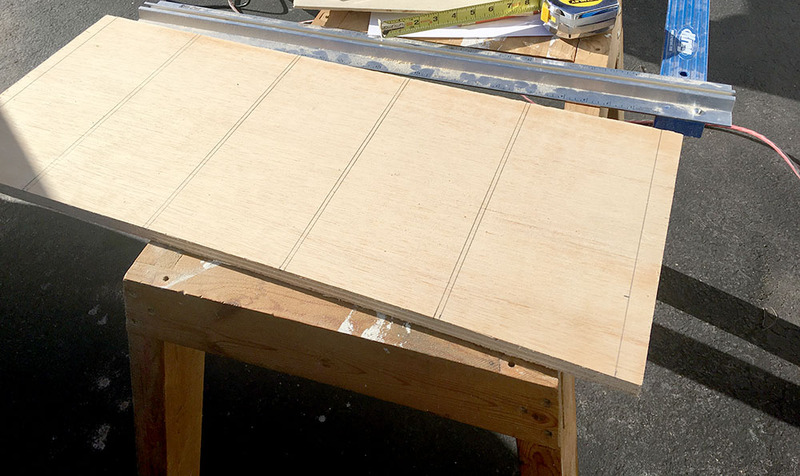 After each cut, I slide the plywood over by 1/8″ until I achieved my desired groove thickness. Times like this I wished I had some dado blades. I would be able to stack multiple blades together to make a 3/8″ cutting surface, and cut out the grooves in one pass, instead of three. To join the plywood pieces together to form a frame, I used construction adhesive, a bar clamp, and my finishing nail gun. 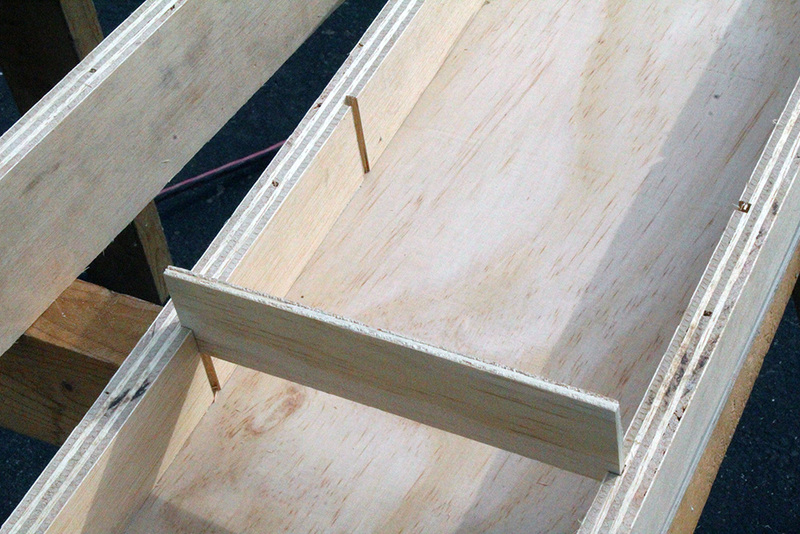 To build the second shelving box, I repeated the same steps for the first box. 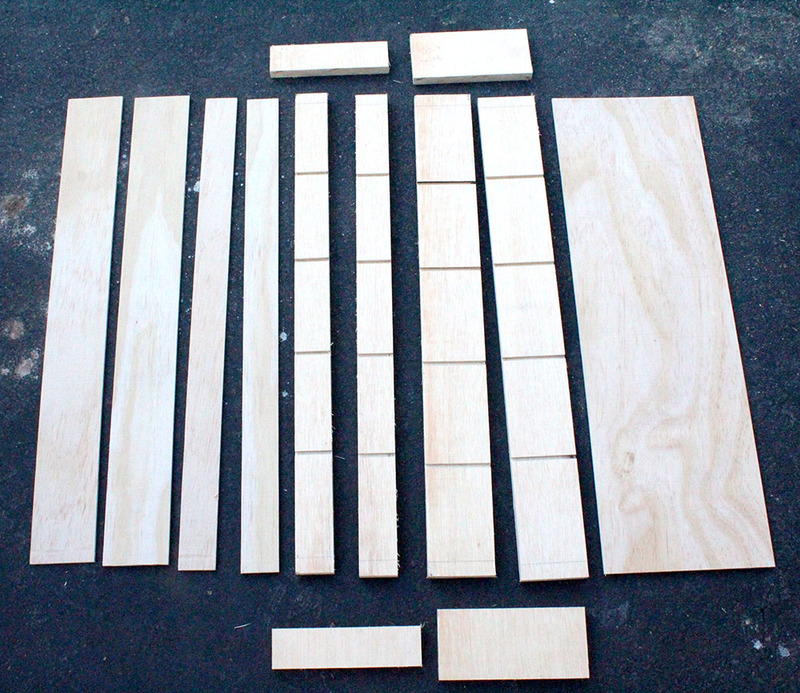 However, I omitted the the 3/8″ plywood backing sheet, as it was not needed for the second box. 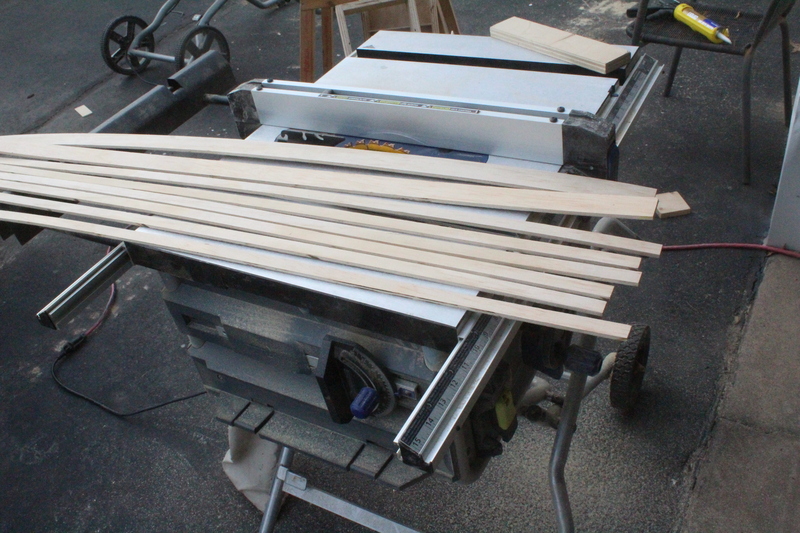 Next it was time to cut 7.5″ long strips of 3/8″ thick plywood for the individual shelves. Theses were going to be inserted into the grooves I cut earlier. Finally, it was time to mount the shelves! I positioned them in between the metal plates attached to the cubbies, and screwed them into the plates. The metal mounting plates (also called mending plates) worked out great because I didn’t have to see screw heads holding the shelves on. Also, I didn’t have to put any visible screw holes into the cubbies in case I wanted to move the shelves somewhere else in the future. However, if you’re doing a similar project, you may not have a mounting area with the same height as your shelves. So it’s just as easy to mount the shelves to a wall. 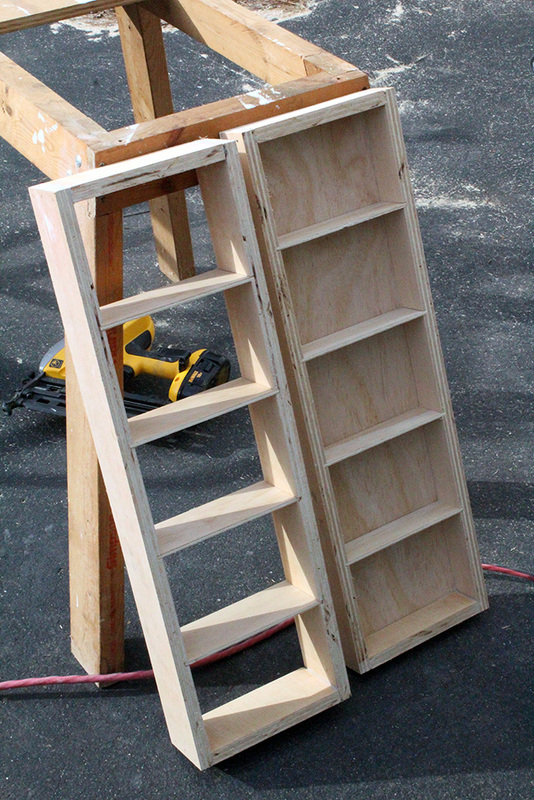 I would suggest using screws with washers to fasten the plywood backing of the inner shelving box to the wall. 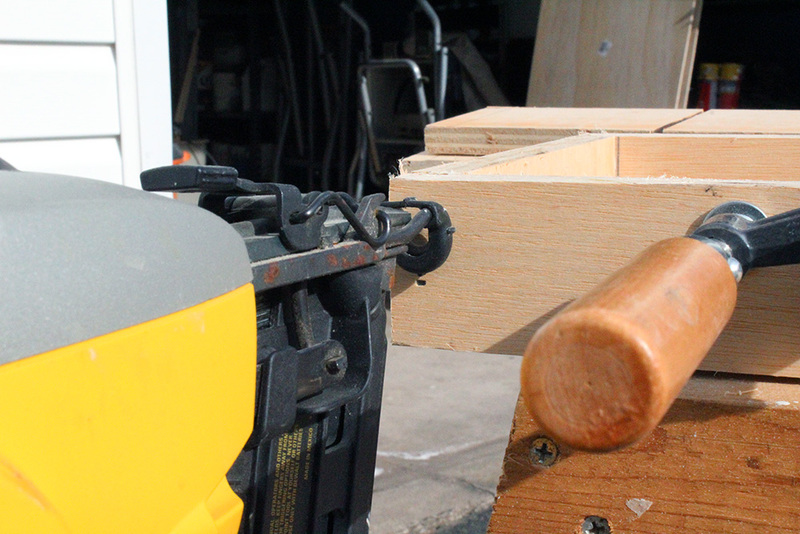 The washers would help prevent the plywood from ripping through the screw heads and falling to the ground under load. Here are some pictures of the awesome mounted shelves. Here is the shelf mounted and empty. You can easily see that the swinging part can hold two rows of acrylic paint. 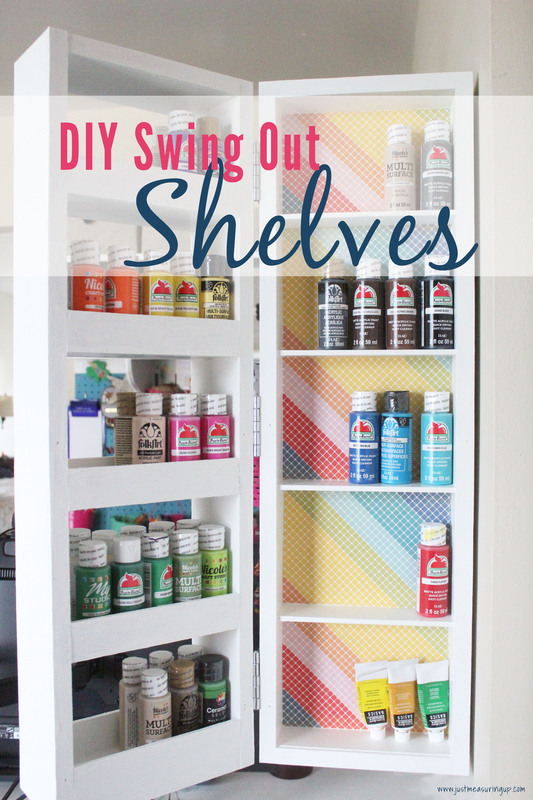 Here is the closed swing out shelf. 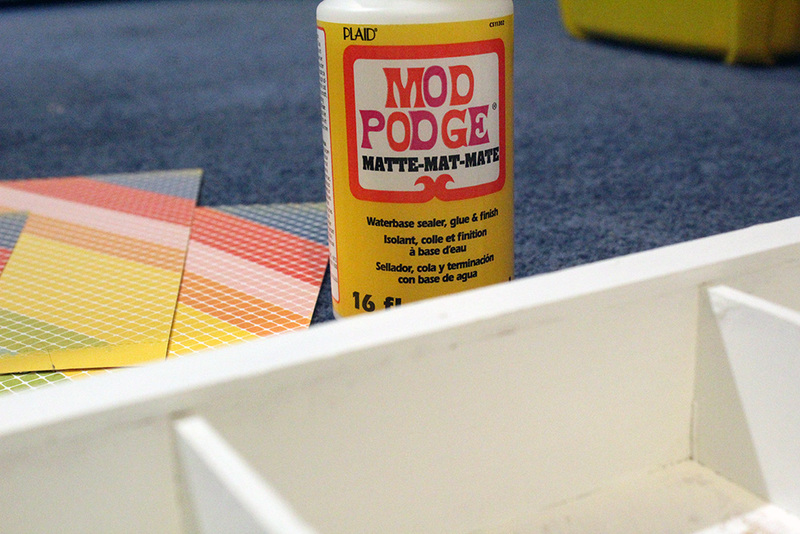 It’s actually three rows deep – the first two rows of paint are on the swinging door. I used all scrap wood for these swinging wall shelves, so the budget was very low – under $15 for the hinges. Even if I had to purchase the wood though, I can’t image it being more than $35 in total to make this project. Be sure to check out all of the below Build to Organize Projects. Enjoy all the inspiration! Getting organized can be expensive. At first, storage bins seem cheap because some only cost a few bucks. 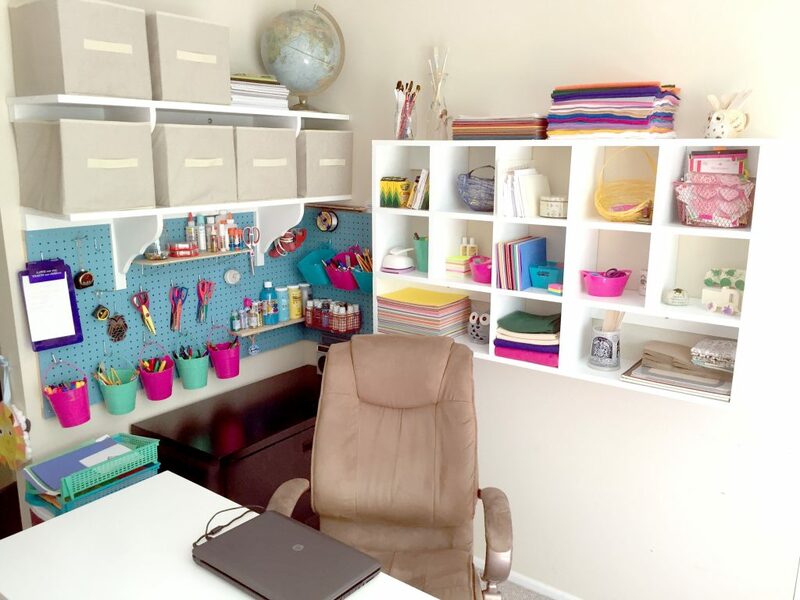 But, multiply that by the number that you need – and you’ll find that getting organized is super pricey. It’s easy to use old Amazon boxes or cereal boxes for organization, but then the bins don’t look as nice. And, I love when things match and look pretty – like the expensive ones in the store. If you’re like me, I have super simple solution for you. 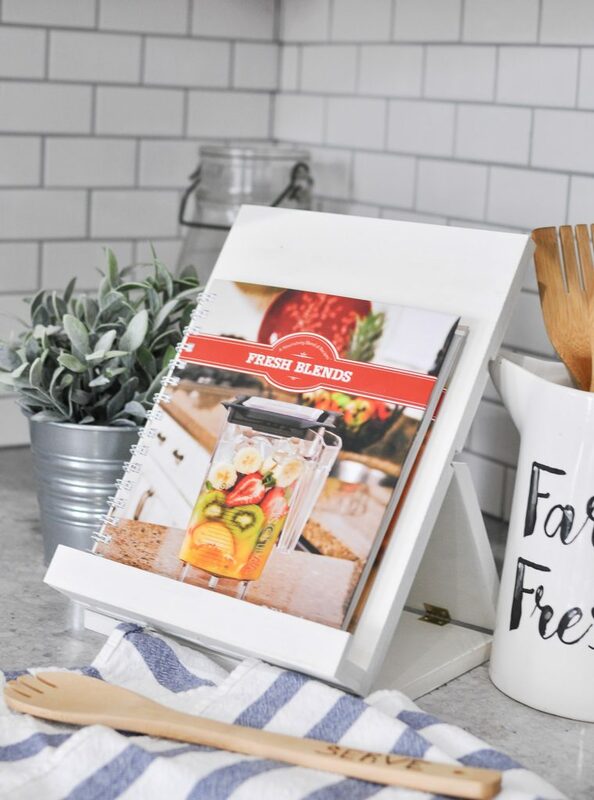 It will help you save money by creating your own storage boxes but the solution will keep you from having to look at Tony the Tiger while putting your things away. 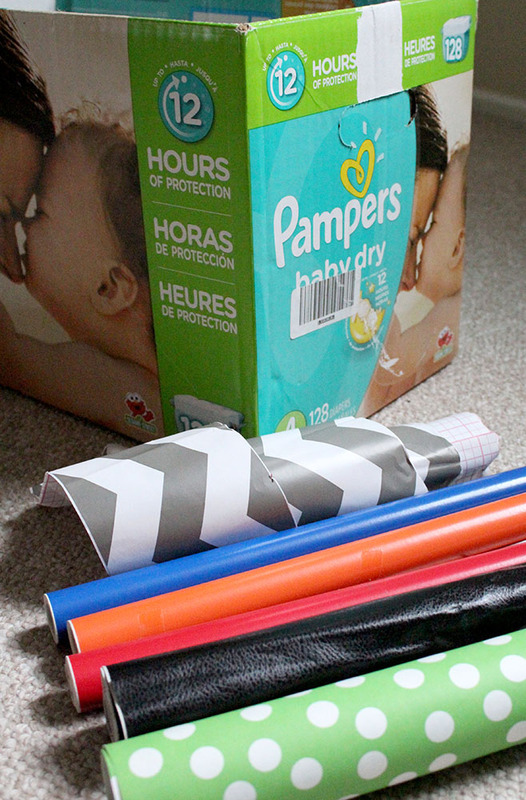 You can easily reuse old cardboard boxes and cover them in contact paper. 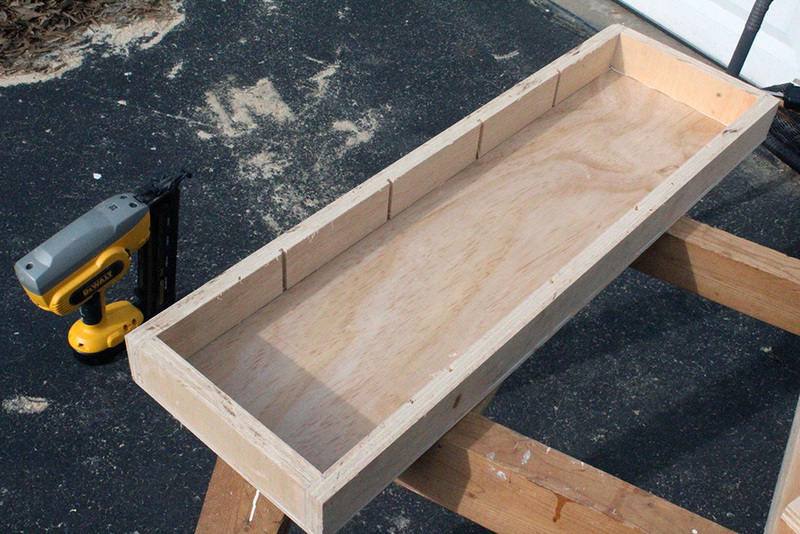 Add a knob and you’ll have yourself a little storage bin that can be easily pulled out. 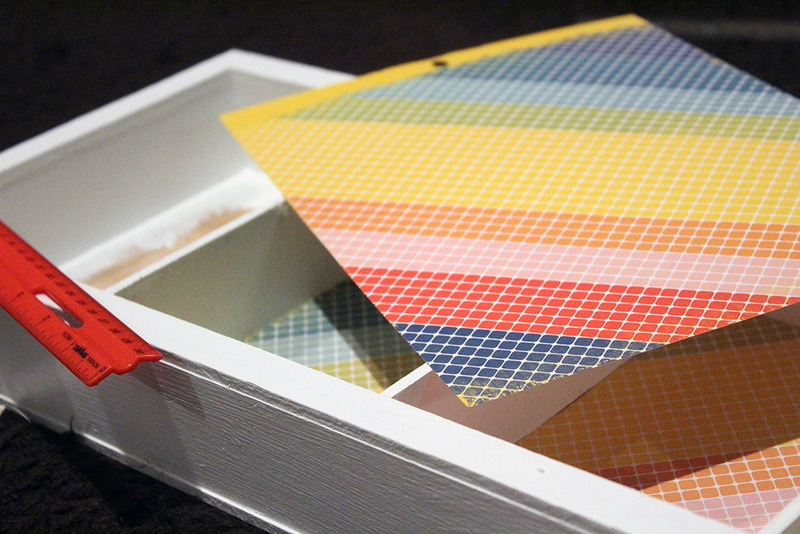 For full instructions, hop on over to my post how to make storage bins from cardboard boxes. 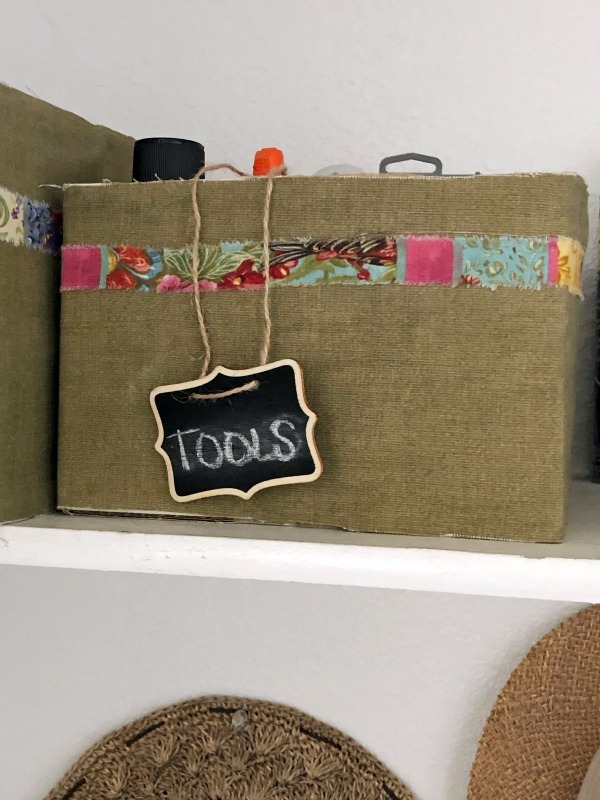 I have these homemade storage bins all over my house, in various sizes and colors, and they are easy, thrifty, and they keep your house looking nice. 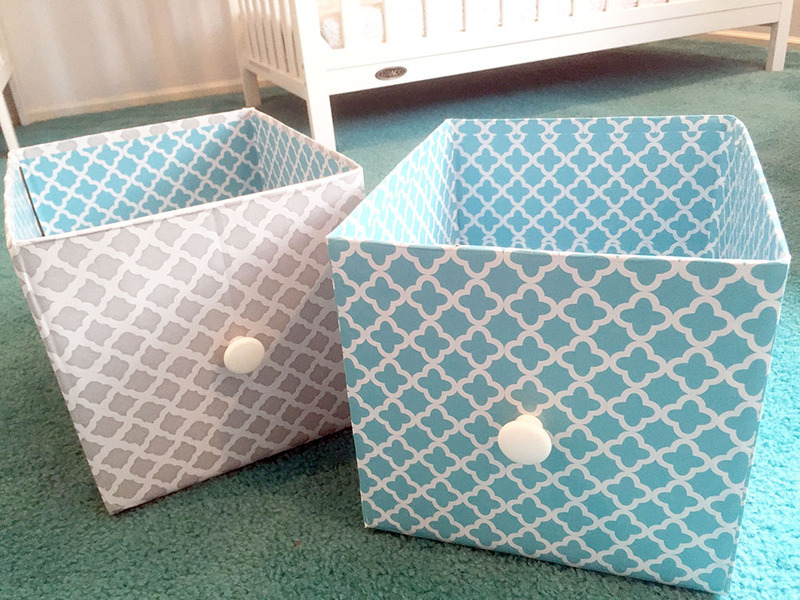 I made the first set of DIY storage bins when I was pregnant with my son, and I couldn’t find changing table bins that were the right size for his discounted changing table. So, I put these together and absolutely LOVED them. 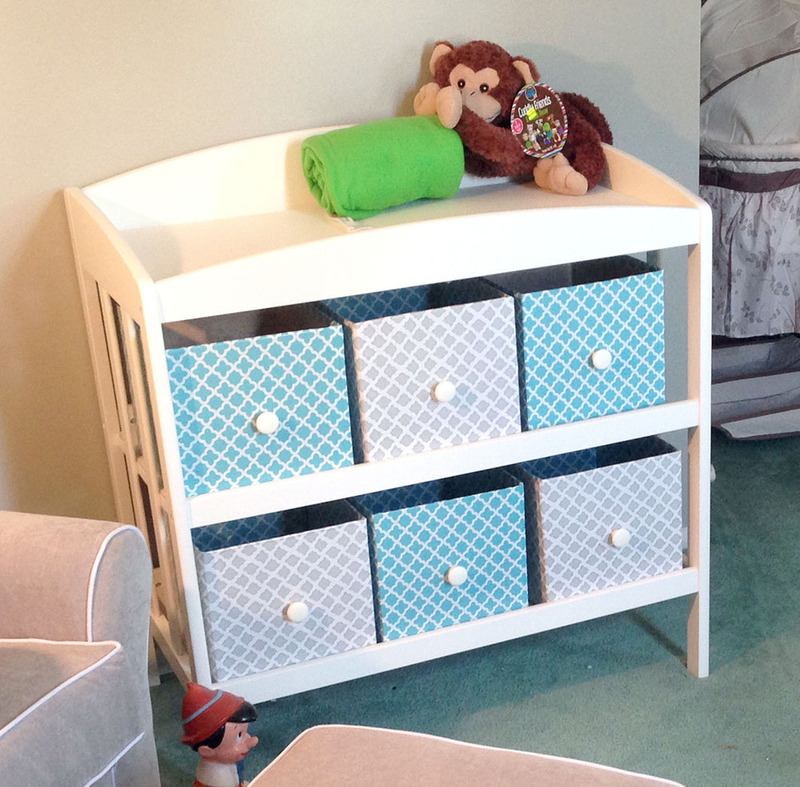 They used the changing table space perfectly, provided plenty of storage, and were really durable. I lined the insides with contact paper too – for easing cleanup. 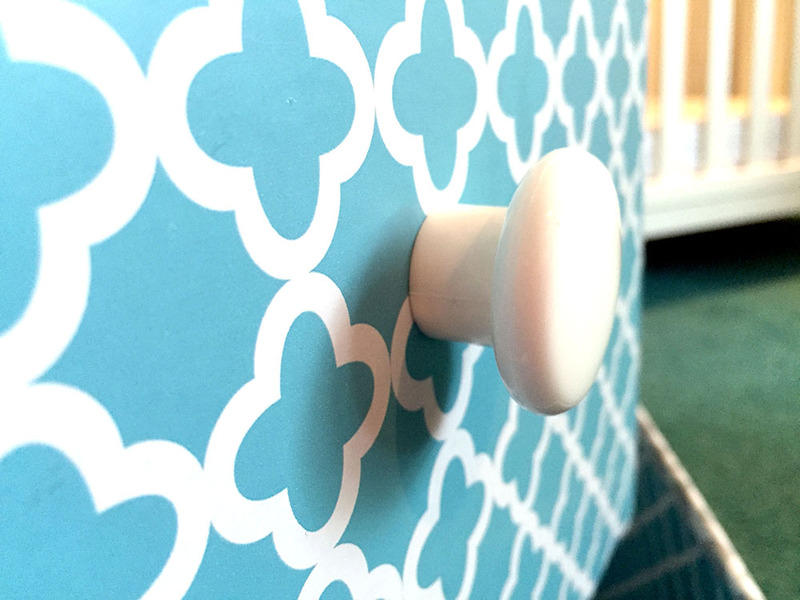 The thing that makes these storage bins so perfect is the knobs. They’ve held up for so many years – even after the constant pulling when grabbing diapers. Check out the how-to post to for easy instructions on this. Since the DIY storage bins turned out so nice, I started organizing everything in my home using random boxes and contact paper. 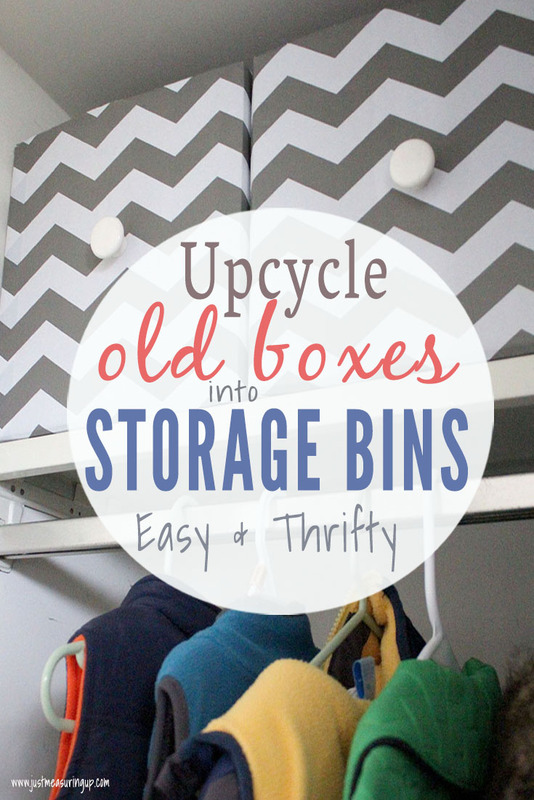 One of my favorite places I used these cardboard box storage bins was in my hall coat closets. Using boxes keeps everything so organized. Everyone in my family has their own boxes for gloves, hats, etc. 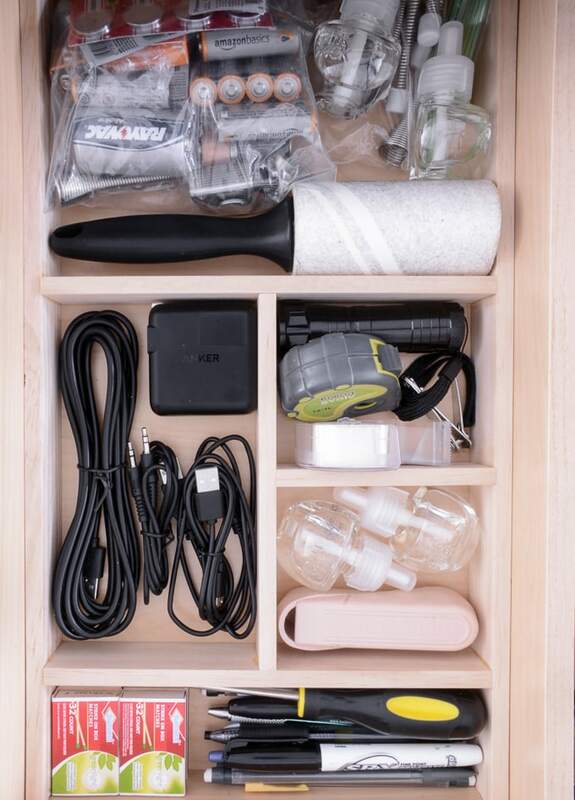 The knob makes the storage drawer easy to pull too. I love how it maximizes the space too. 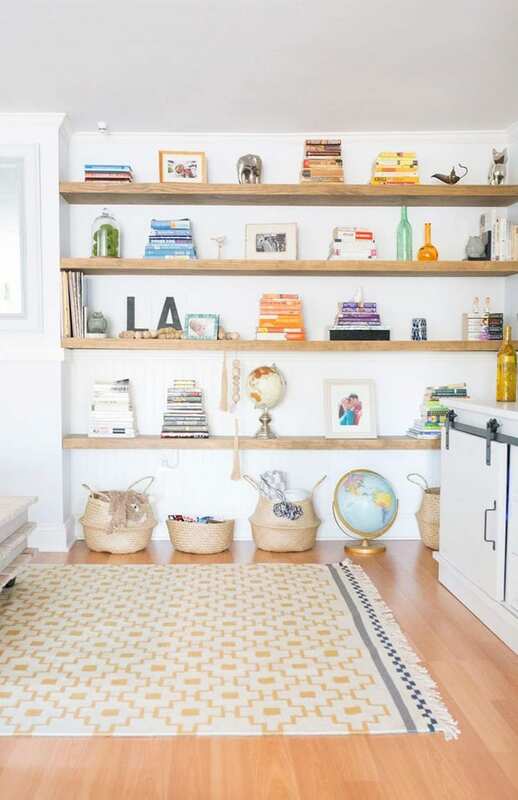 Every bit of space is used – from the shelf to the ceiling. 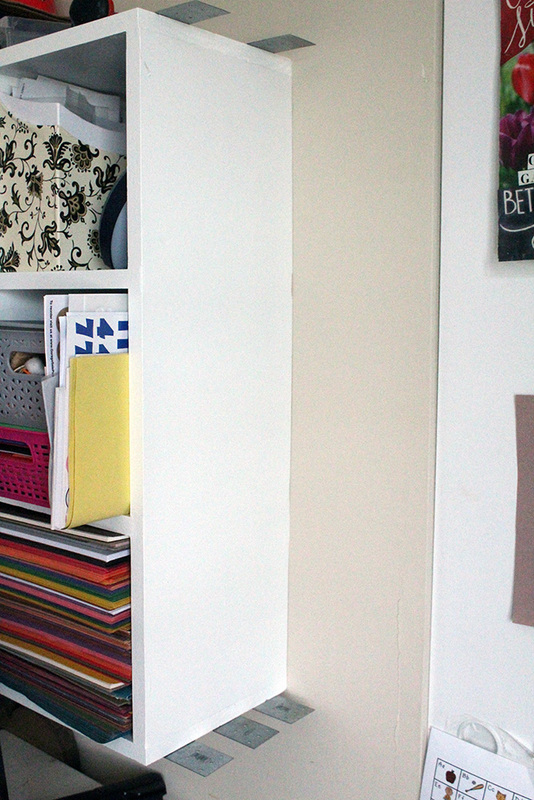 We actually have double shelves in here – so I can fit 8 of these storage boxes in the closet! In the pantry, I also have these bins. I don’t like resting food and drinks directly on the floor, so I originally used baby wipe boxes. I had some leftover contact paper from the closet project, so I whipped these together. How much better does this look?! I saved up all the diaper boxes for months and covered them in black contact paper. One type of contact paper had a leathery look, which was cool, and the other was chalkboard contact paper. I loved how different and modern the chalkboard storage boxes looked. It shows how you can achieve any kind of look you want depending on the contact paper. 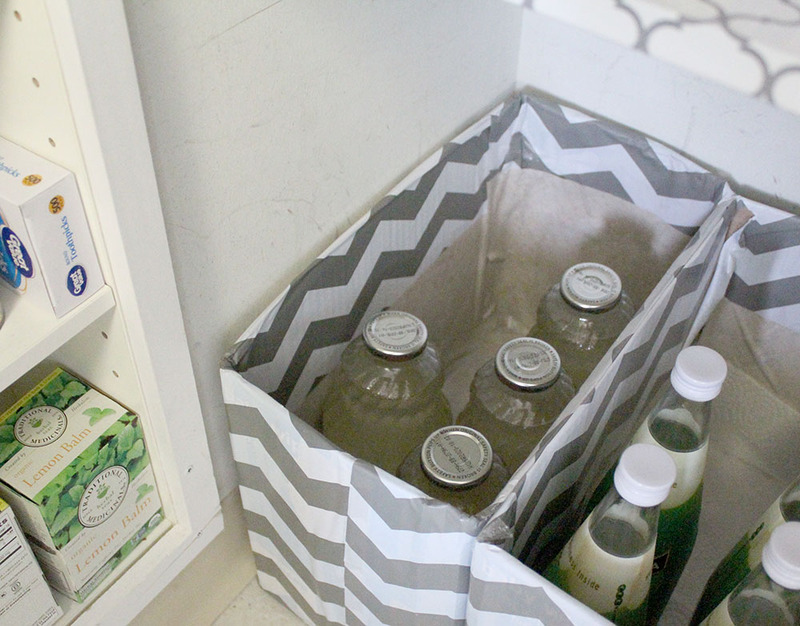 You can use these DIY storage bins anywhere that you need smaller compartments to organize things. 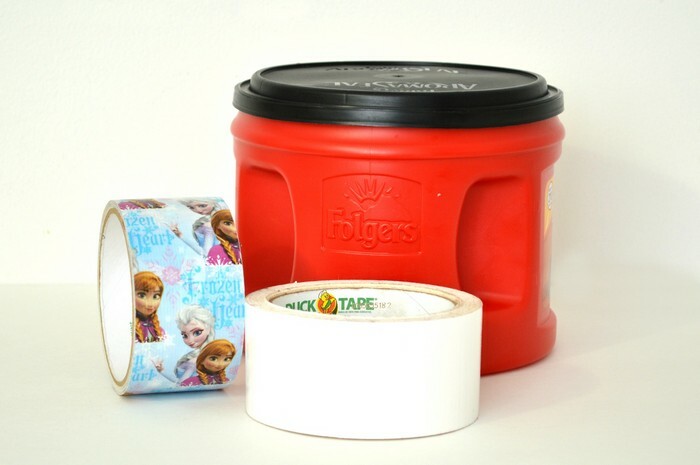 They are great for toy storage because the boxes are sturdy but light – and the knob makes it easy for kids to pull. 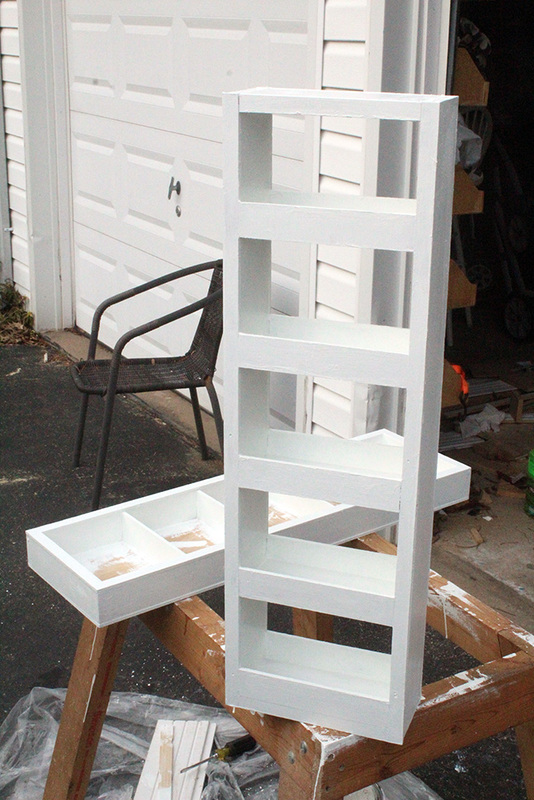 You can make these storage bins to fit into cubby shelves too. 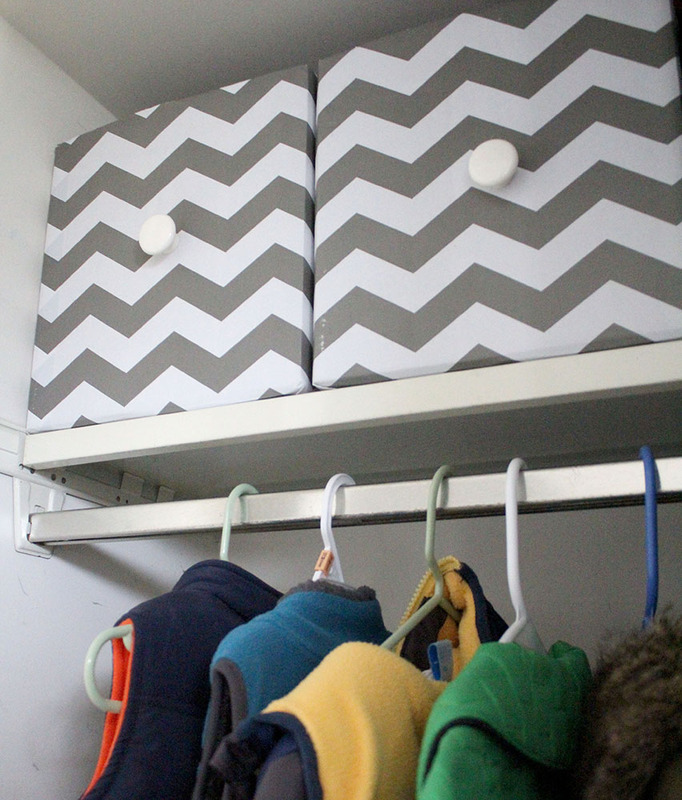 The DIY storage bins could be used a filing system for papers or mail. 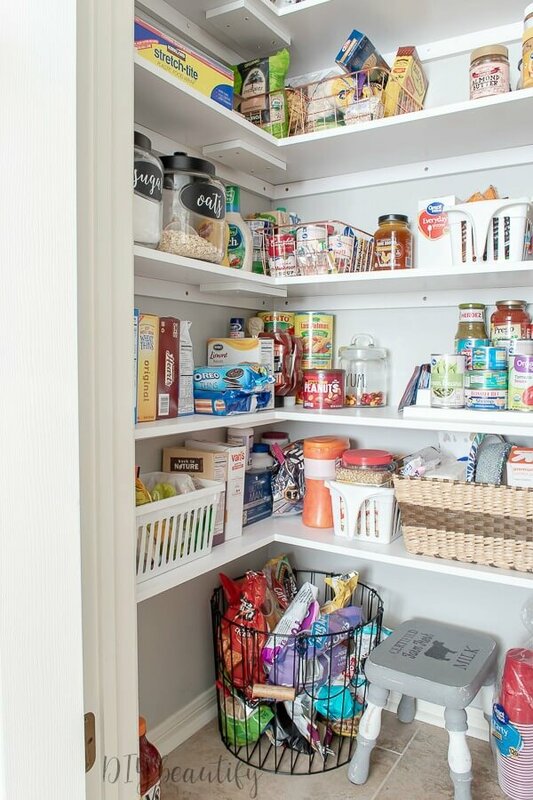 You can use the storage bins on any kind of shelf. For example, if you have a bookshelf, but toys line the bottom – this is a perfect way to hide those toys in a stylish way. 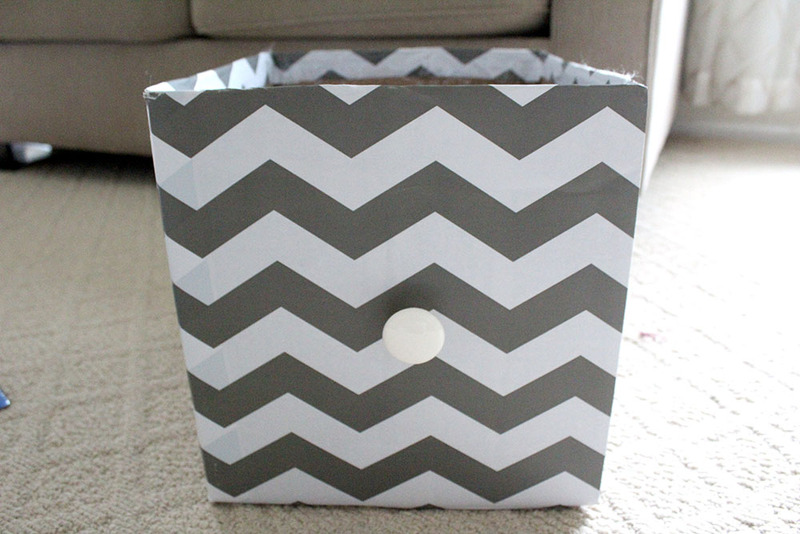 Basically, save all of your old boxes, pick up some contact paper at the dollar store and start getting organized! 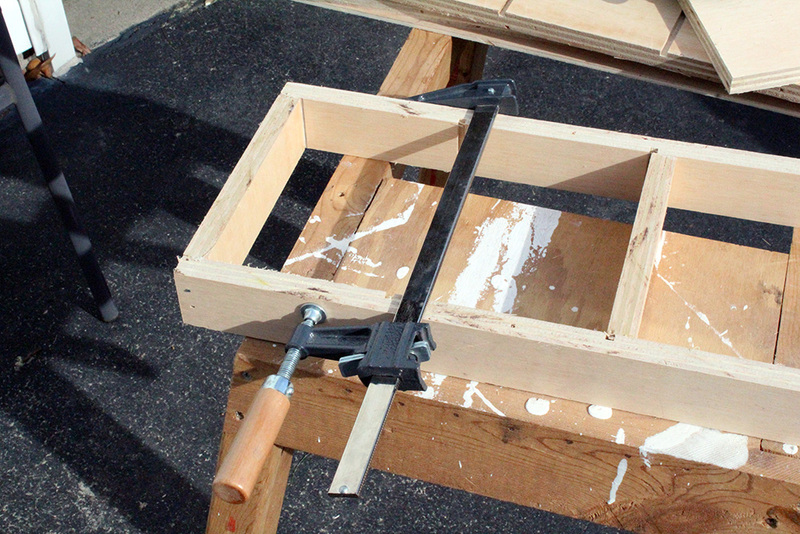 Here’s one more look at our changing table – the original inspiration for the cardboard storage boxes.